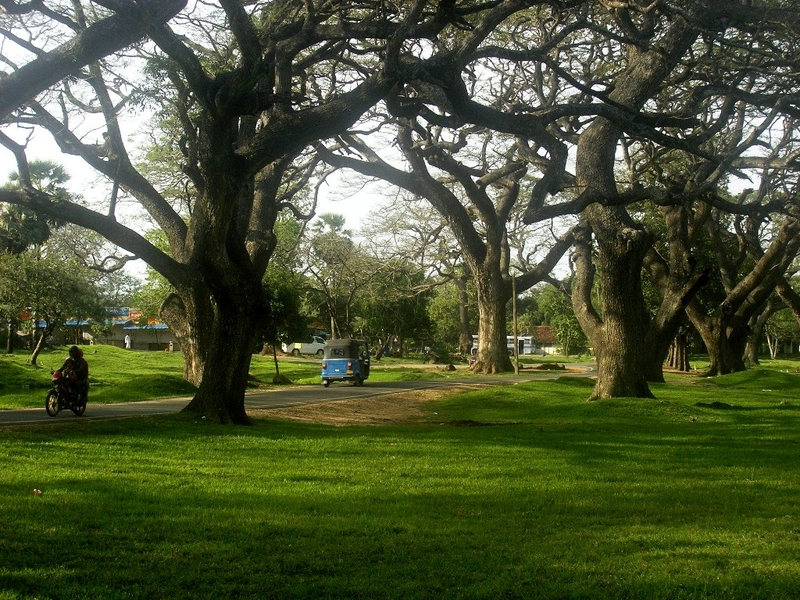 Images taken in February 2015. Die Bilder lassen sich durch Anklicken vergrößern. Bei Hochformat werden die Bilder durch Anklicken auf Bildschirmgröße gebracht. 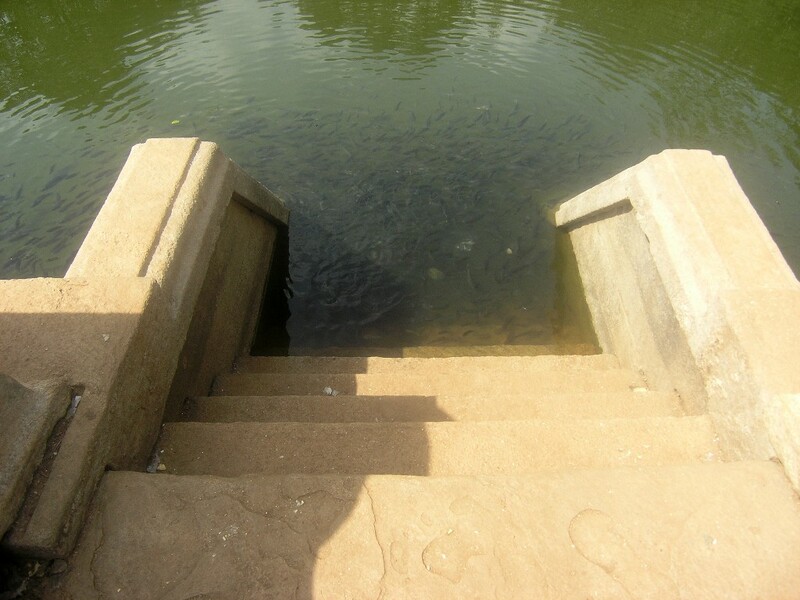 Clicking on the images will enlarge them. Clicking on vertical format images will make them fit the screen. 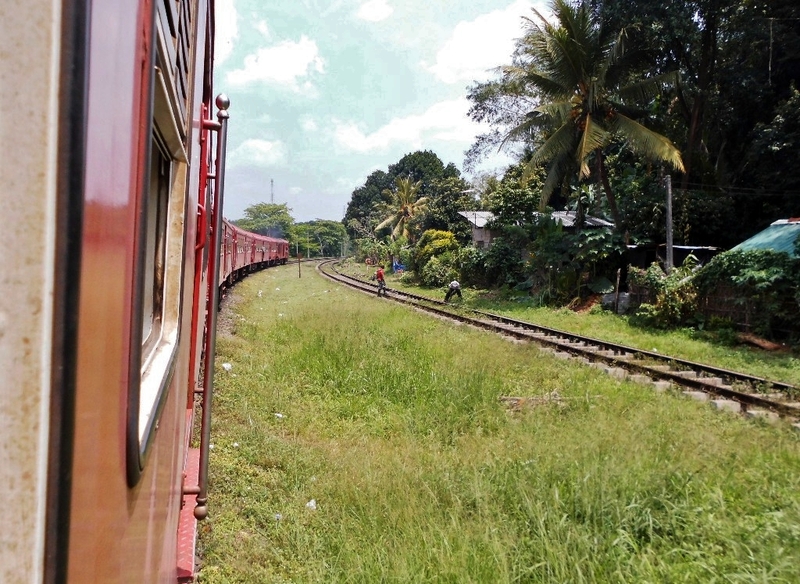 Die nächste Etappe unserer Ceylon-Reise sollte uns mit der Bahn von Colombo nach Anuradhapura führen. 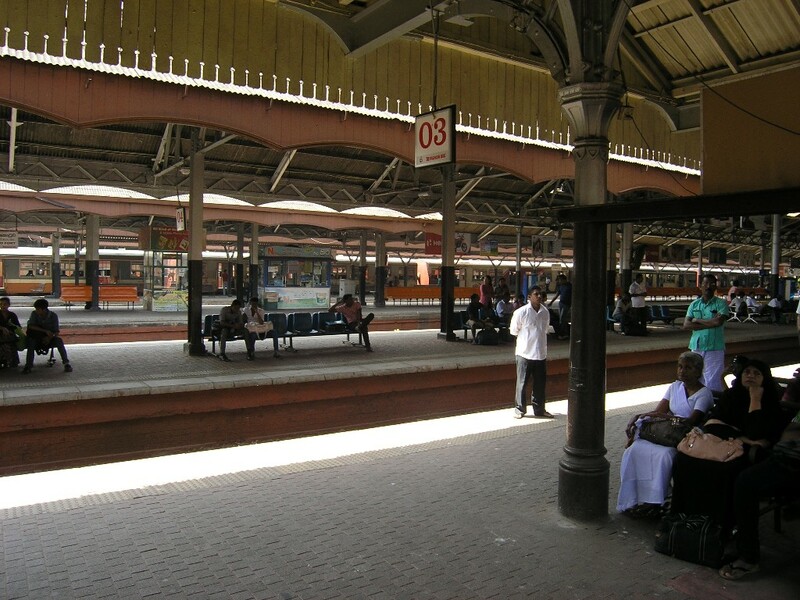 Der geschäftige Hauptbahnhof von Colombo ist durchaus verwirrend, besonders wenn man nicht lesen kann. Diese Anzeigetafel zeigte ihre Informationen periodisch auch in lateinischer Schrift, funktionierte allerdings nur teilweise und später gar nicht mehr. Auf Fragen kamen hilfsbereite Antworten, die man aber auch nicht unbedingt sicher war, verstanden zu haben. 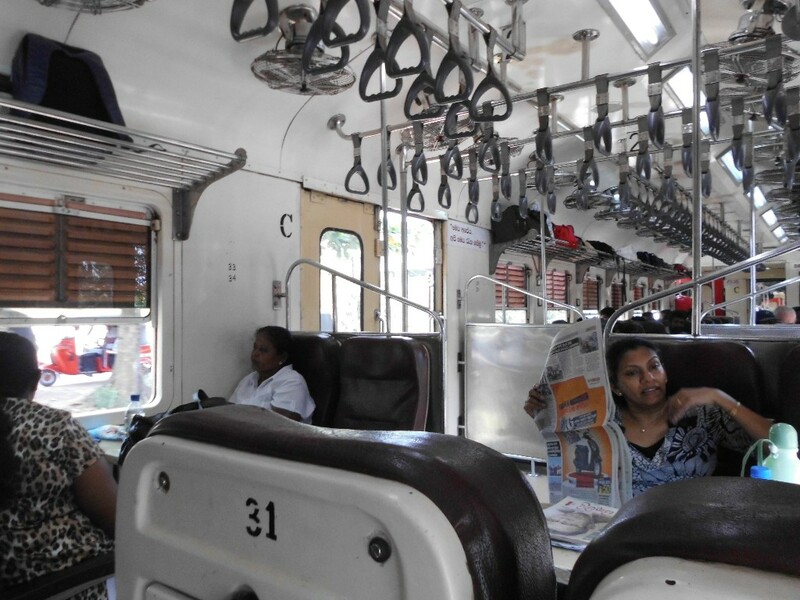 The next leg of our trip through Ceylon was to take us by train from Colombo to Anuradhapura. 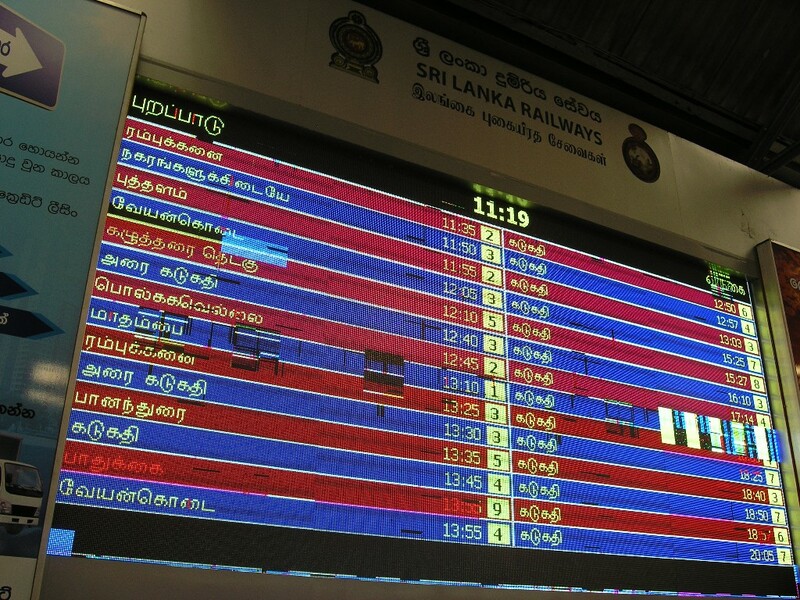 The busy main railway station in Colombo can be confusing to navigate, especially if you cannot read. This electronic display periodically offered Latin script too, but it was functioning only partially and eventually stopped functioning altogether. Questions elicited helpful answers, which however you were rarely quite sure of having understood properly. Gibt es wohl eine Bahnhofstoilette? 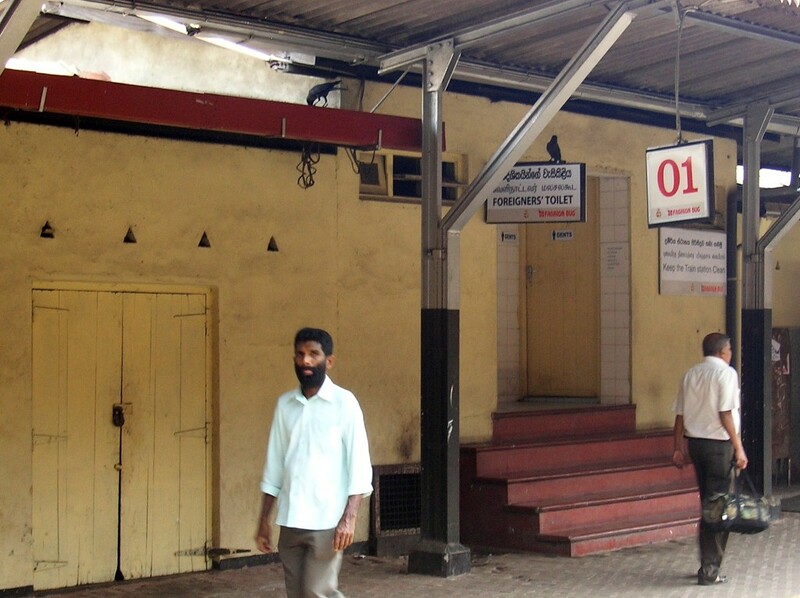 Would there be a public toilet somewhere in the station? Mehr als eine. Die normale — wahrlich nicht einladend. Dann die „Fremdentoilette“ — da hätte man aber den Schlüssel vom Bahnhofsvorsteher holen müssen. More than one. The ordinary one — truly not very inviting. 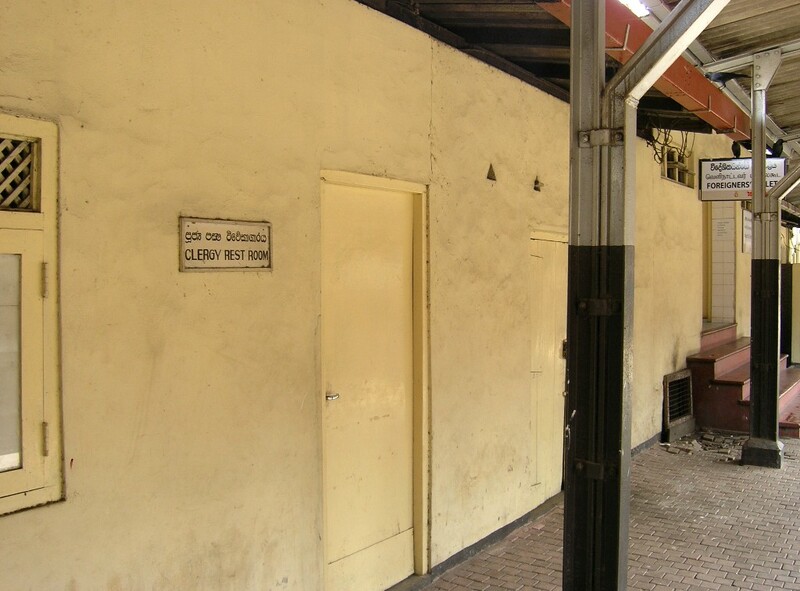 Then the „foreigners‘ toilet“ — but you would have had to get the key from the station master. Schließlich die Toilette für die Geistlichkeit. Für „clergy“ sind auch oft Sitze in Bussen reserviert. Ich beschloß, mich darauf zu verlassen, daß der Zug schon auch ein Klo haben würde. Er hatte — auch nicht sonderlich sauber, aber nutzbar. Finally the toilet for clergy. Buses too often have reserved seats for „clergy“. I decided to rely on the train having a toilet too. It did — not particularly clean, but serviceable. 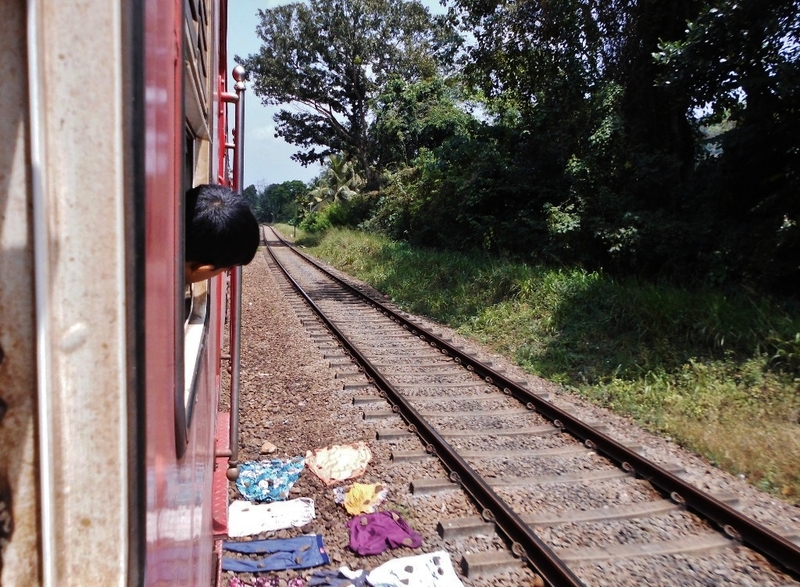 Züge auf Ceylon führen normalerweise Wagen erster, zweiter und dritter Klasse und sind, das sollten wir noch herausfinden, normalerweise überfüllt. 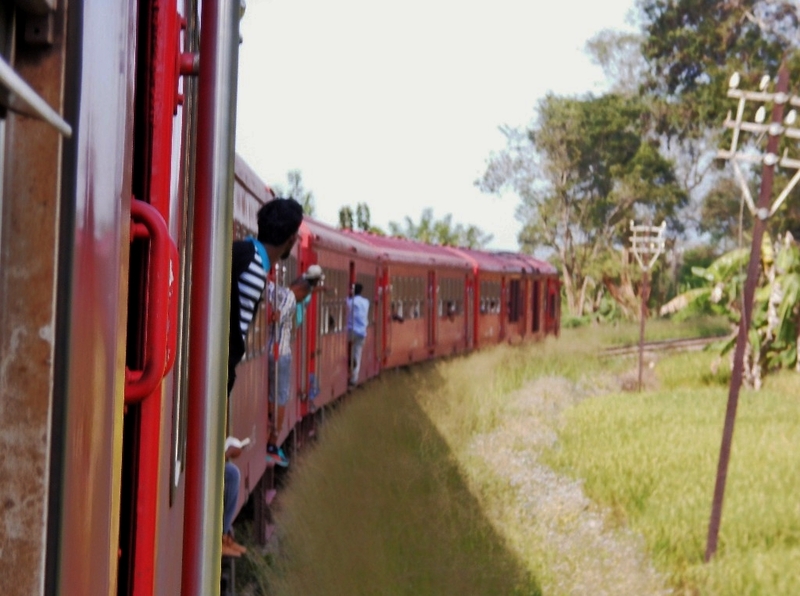 Dieser Zug nach Anuradhapura (und weiter Richtung Inselnorden) war reservierungspflichtig und führte nur eine Klasse (ob das nun die erste oder die zweite sein sollte, konnten wir nicht herausfinden — die dritte jedenfalls hat keine Einzelsitze wie hier, sondern Holzbänke). Wir standen am Fahrkartenschalter (ein eigener nur für diesen Zug) in der Schlange, als es hieß, alle Plätze für den kommenden Tag seien vergeben. Zum Glück wollten wir erst tags darauf fahren. 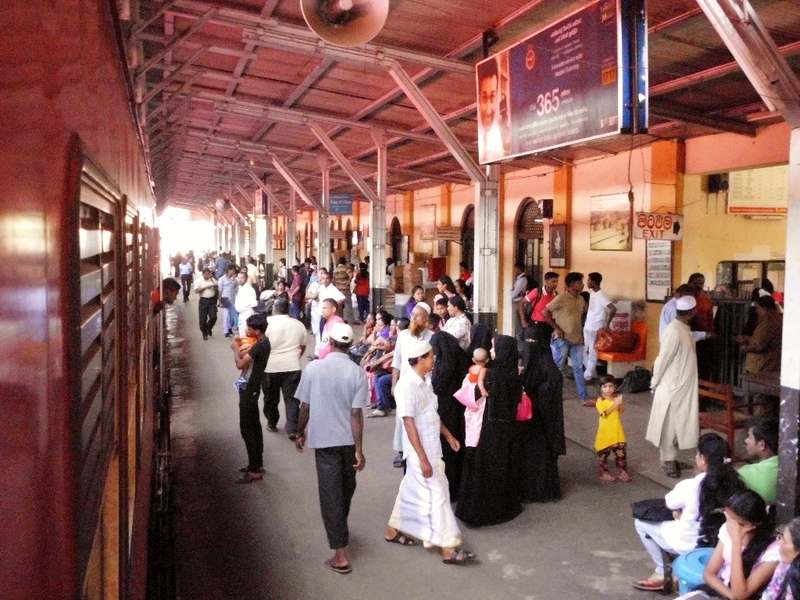 Tatsächlich waren dann in Colombo einerseits alle Sitzplätze belegt, andererseits knubbelten sich die Leute aber nicht in den Gängen — daß die Wagen genau darauf ausgelegt sind, lassen indes schon die vielen Haltegriffe erkennen. Ich kann mir nicht vorstellen, daß die Reservierungspflicht an den späteren Bahnhöfen noch bestand, drängelig wurde es aber nie, vielmehr gab es dann auch freie Sitzplätze. Unter den Fahrgästen viele Touristen, aber genauso Einheimische. 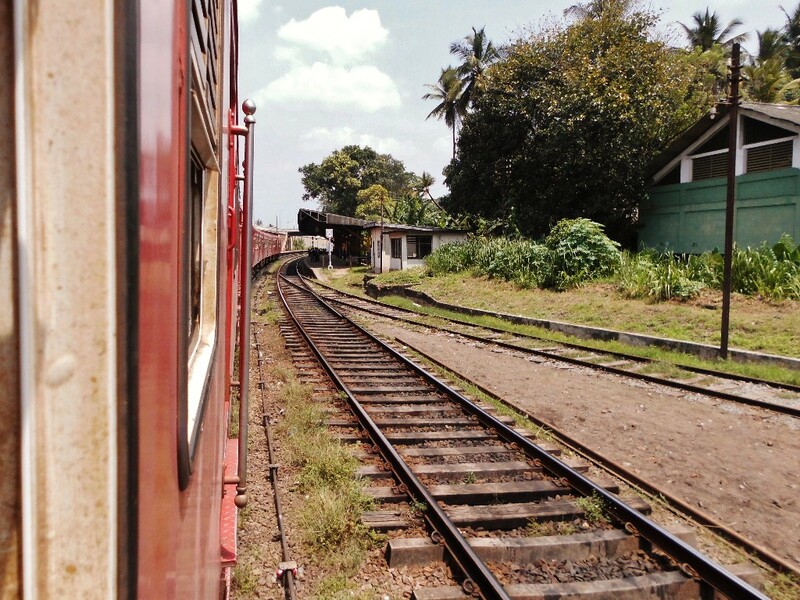 Trains in Ceylon normally have first, second and third-class carriages and as we were going to find out they are normally overcrowded. 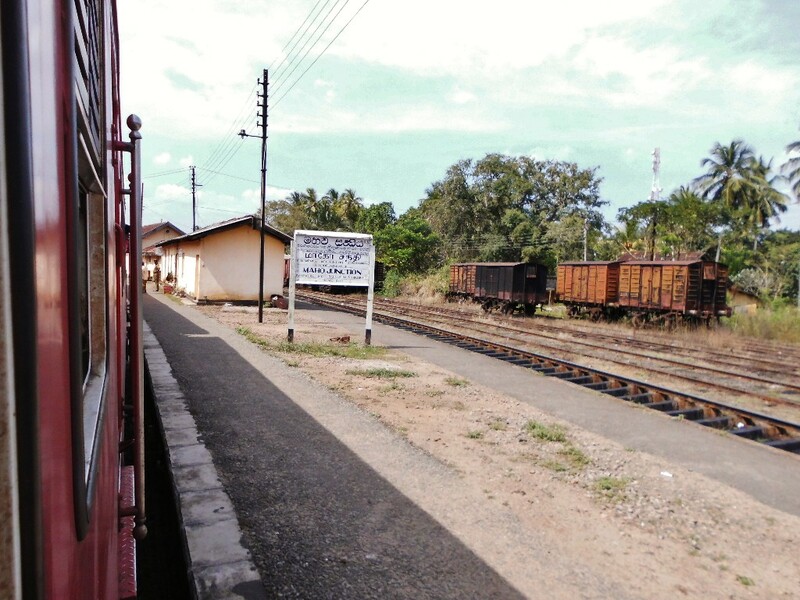 This train bound for Anuradhapura (and then the north of the island) required advance reservations and there was only one class (we were unable to determine whether it was supposed to be first class or second class — third class does not have individual seats as here, but wooden benches). At the station there was a special counter just for this train, in front which we were standing in line when it was announced that all seats for the following day had been sold. Luckily we wanted to go the day after. 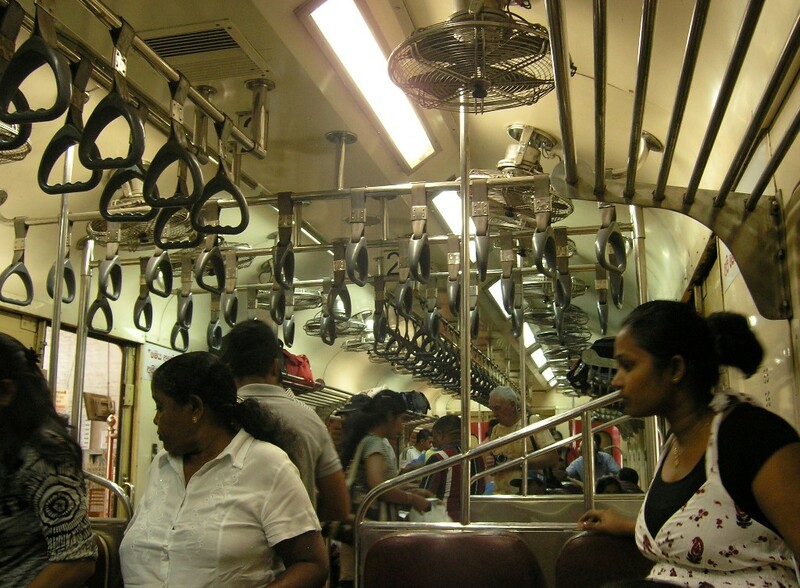 On that day all the seats were indeed taken, but on the other hand there were no people crowding the corridors — the multitude of handholds makes it clear that the carriages are in fact designed with this in mind. I don’t think people boarding the train at subsequent stations still had to have reservations. This train never did get crowded, in fact later on there were free seats. Among the passengers there were many tourists, but natives too. Nördlich von Colombo ist die Strecke zunächst noch zweigleisig. Wäsche zu trocknen ist in dem feuchten Klima wenige Breitengrade nördlich des Äquators ein Problem. Bahndämme eignen sich offenkundig gut dafür. 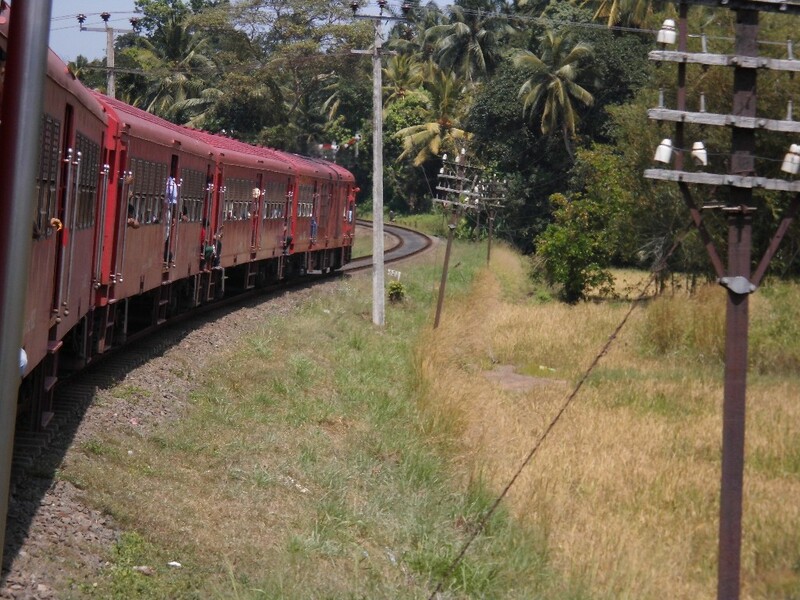 North of Colombo the line is still double-track. Drying laundry is difficult in this humid climate just a few degrees north of the equator. Clearly railway embankments are helpful here. 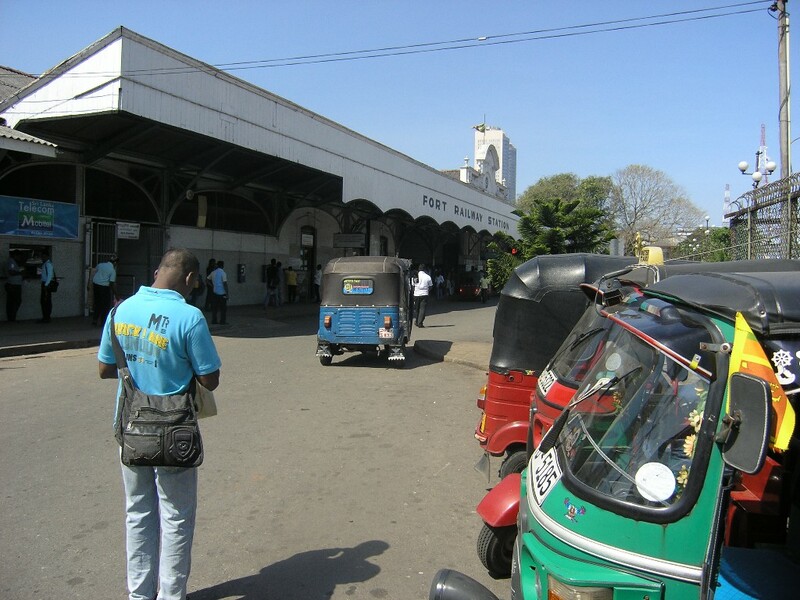 Bahnhof Kurunegala. 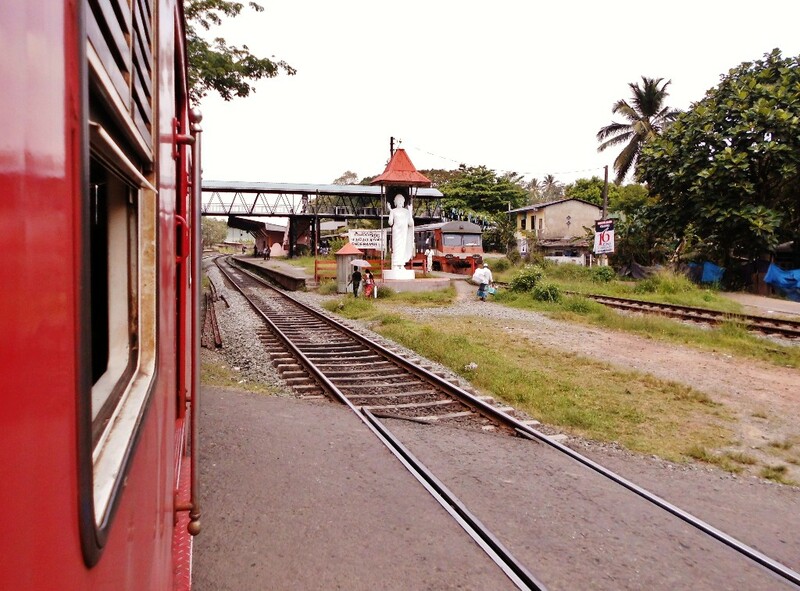 — Kurunegala station. Weiter nördlich wird die Strecke eingleisig. Further north the line becomes single-track. Typisch für die Landschaft der Insel die vielen Seen, meist schon vor Jahrhunderten künstlich angelegt und Teil von Bewässerungssystemen. 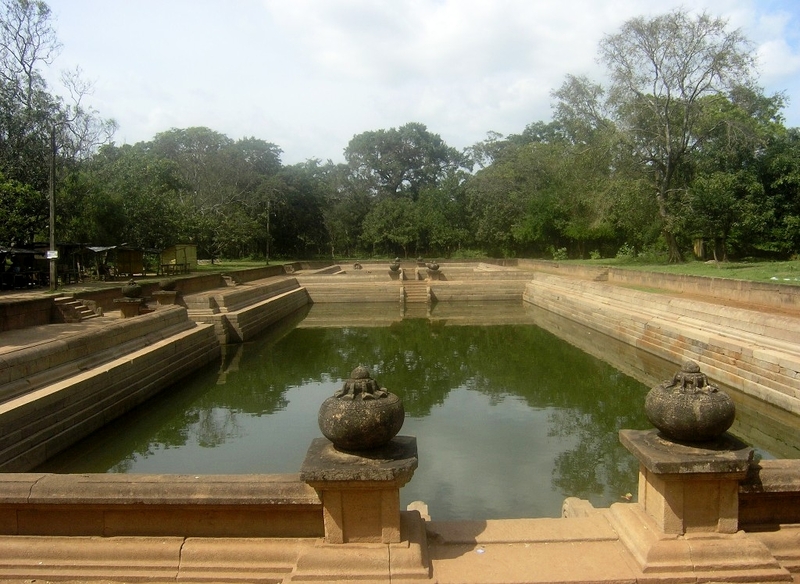 The many lakes, mostly created artificially centuries ago as part of an irrigation system, are a typical feature of the landscape. Für die 200km lange Strecke hätte der Zug laut Fahrplan vier (!) Stunden benötigen sollen. Er schaffte es in viereinhalb. 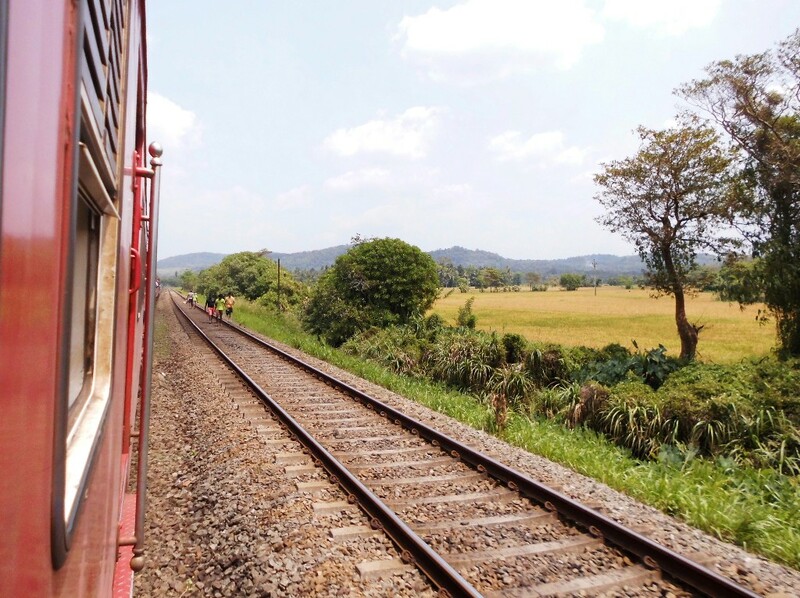 According to the schedule the train was to cover the 200km distance in four (!) hours. It managed to do so in four-and-a-half hours. 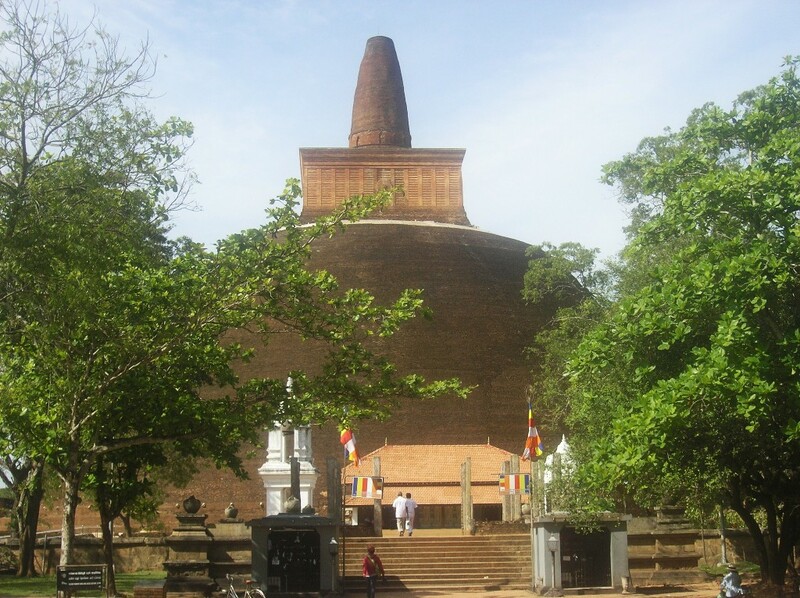 Anuradhapura war vom 4. Jahrhundert vor unserer Zeitrechnung bis zum 11. Jahrhundert Hauptstadt des wesentlichen buddistischen Königreichs auf der Insel. 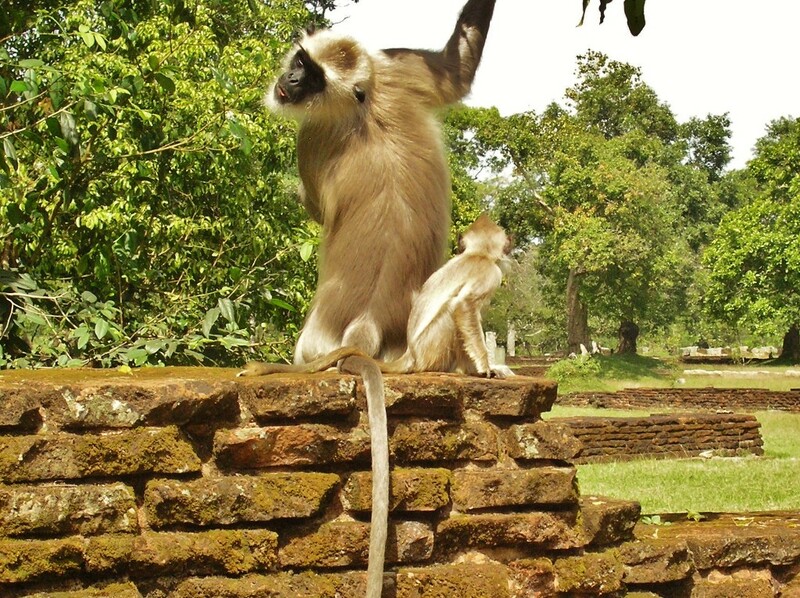 Hier wächst (immer noch) ein Baum, der aus einem Zweig des ursprünglichen Bodhi-Baums gezogen sein soll, unter dem einst Buddha die Erleuchtung zuteil wurde. 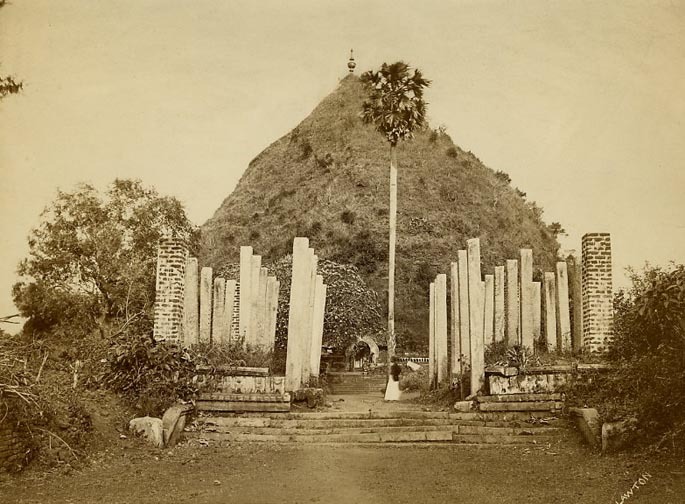 Von der einst offenbar riesigen Stadt sind vor allem die ziegelgemauerten Dagobas (Stupas) erhalten, daneben einige Reste königlicher Palastanlagen. 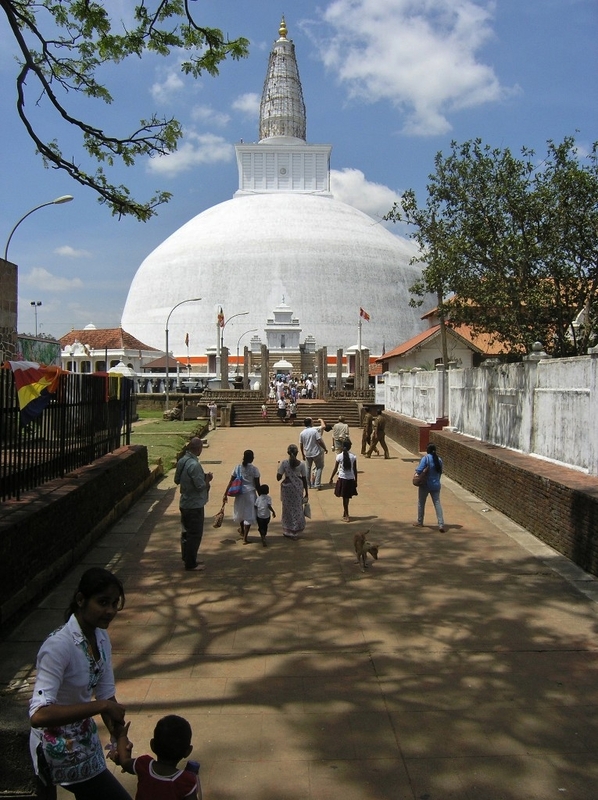 Oben: Jetavanaramaya. 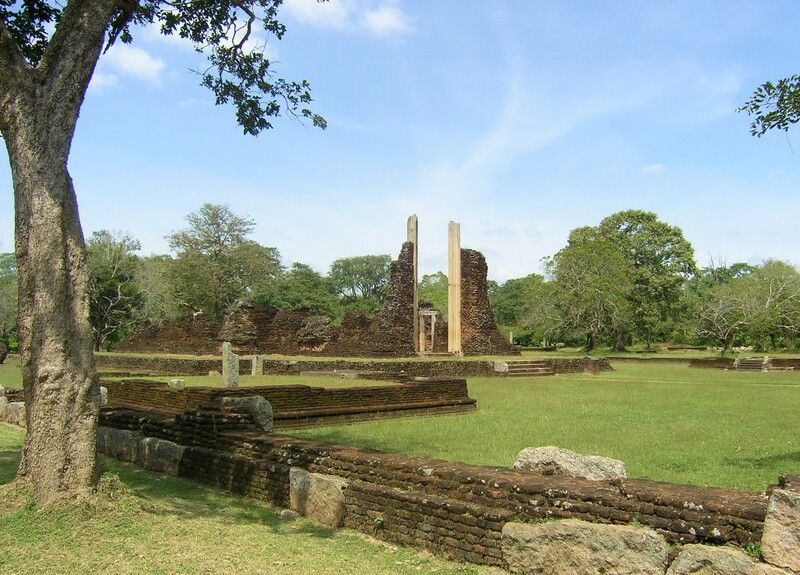 From the 4th c. BCE until the 11th c. Anuradhapura was the capital of the main Buddhist kingdom in the island. 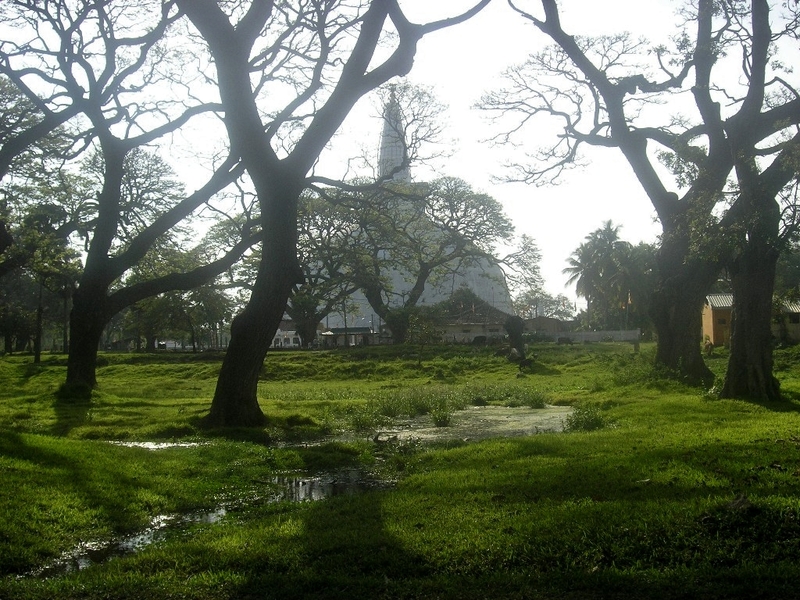 A tree supposedly grown from a cutting of the original Bodhi tree (under which Buddha found enlightenment) still flourishes here. 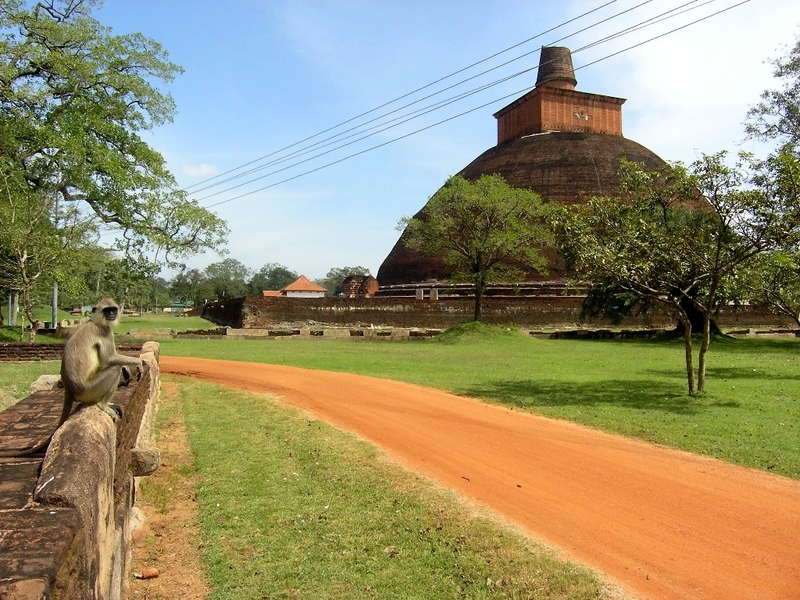 Clearly the city was once huge; what mostly now remains are the brick-built dagobas (stupas), along with some traces of royal palaces. 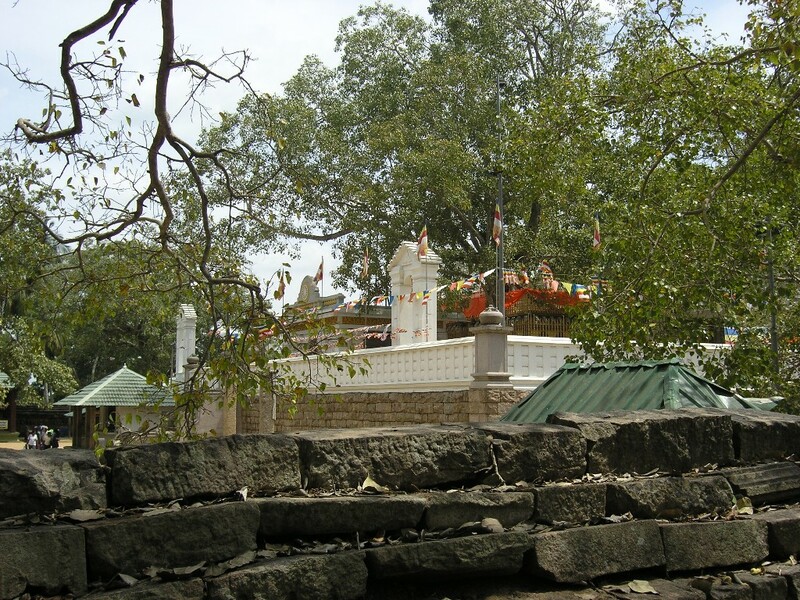 Above: Jetavanaramaya. Um die Dagobas herum liegen dutzende und aberdutzende, wenn nicht hunderte kleinerer Heiligtümer, die sich als ziegelgemauerte Plattformen zu erkennen geben und anscheinend früher Pfeilerhallen trugen. 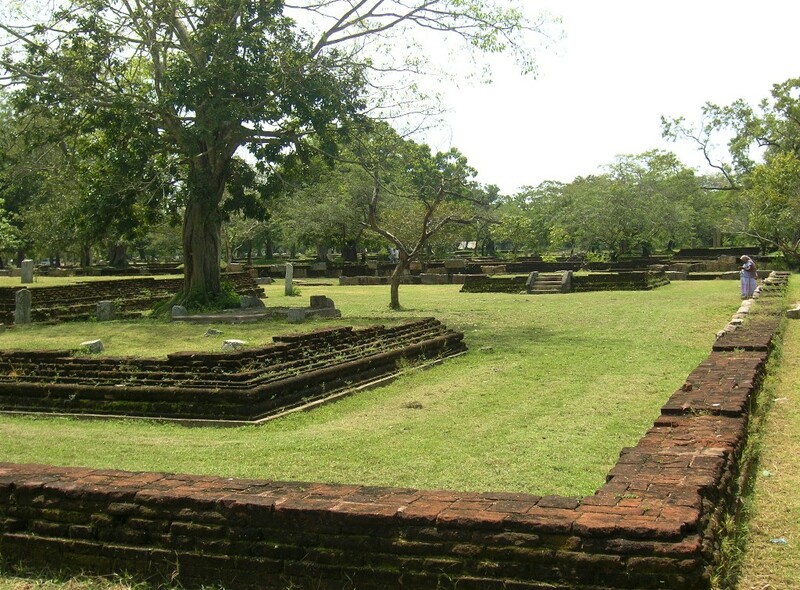 Surrounding the dagobas are dozens and dozens, indeed probably hundreds of smaller sanctuaries recognisable by the brick-built platforms which, it seems, formerly carried pillared halls. Südansicht. 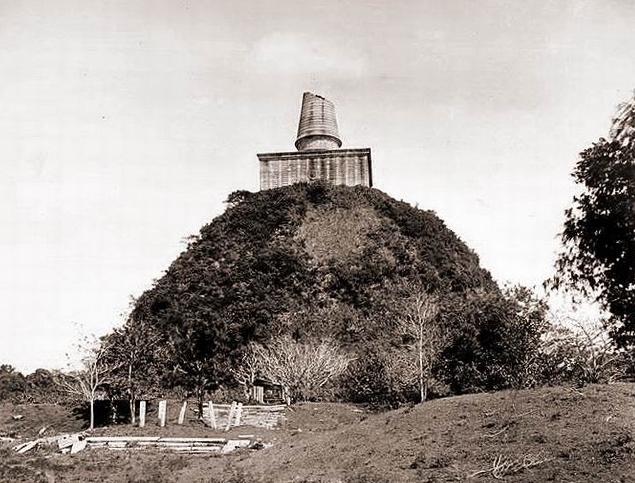 Die Höhe dieses Dagoba wird mit 122 Metern angegeben, als ihr Erbauer Mahasena (König 274-301). Das Schild fordert, vor Betreten der Plattform die Schuhe auszuziehen. Seen from the south. 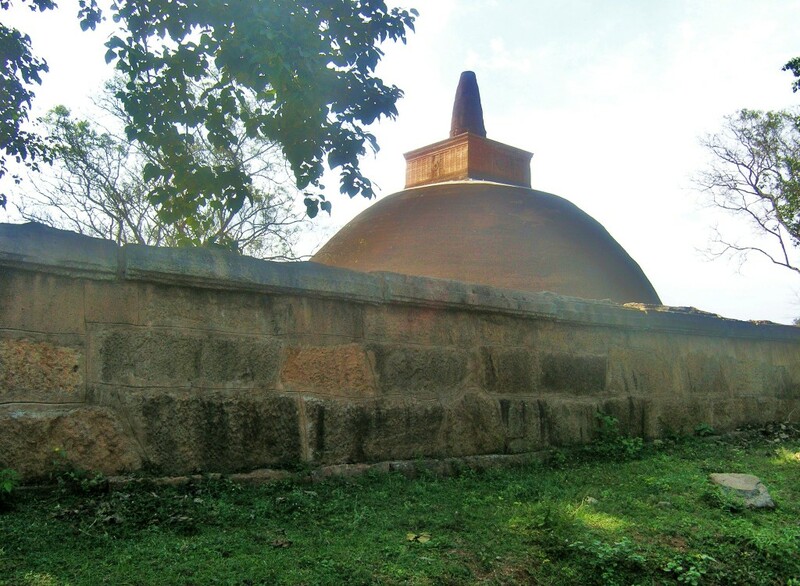 The height of this dagoba is given as 122 metres, and it is said to have been built by King Mahasena (reigned 274-301). The sign asks you to take off your shoes before stepping on the platform. 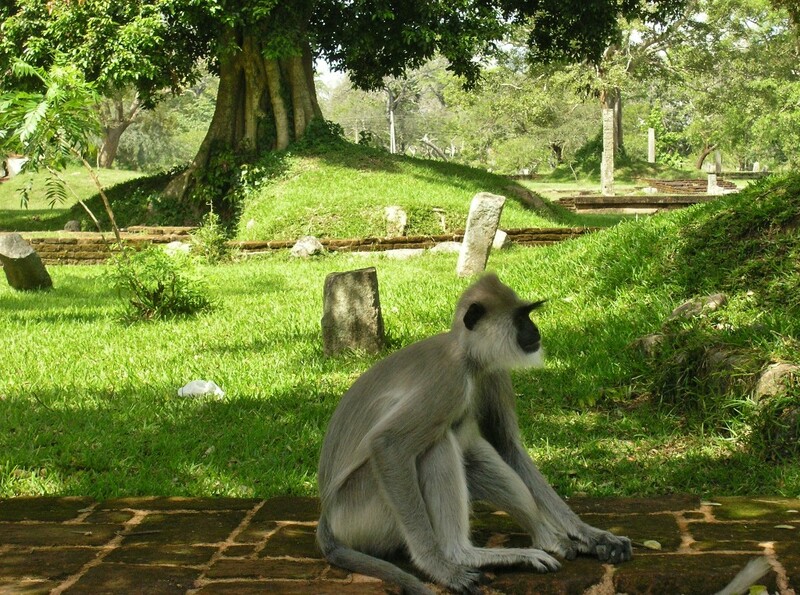 Anuradhapura war über Jahrhunderte praktisch verlassen. 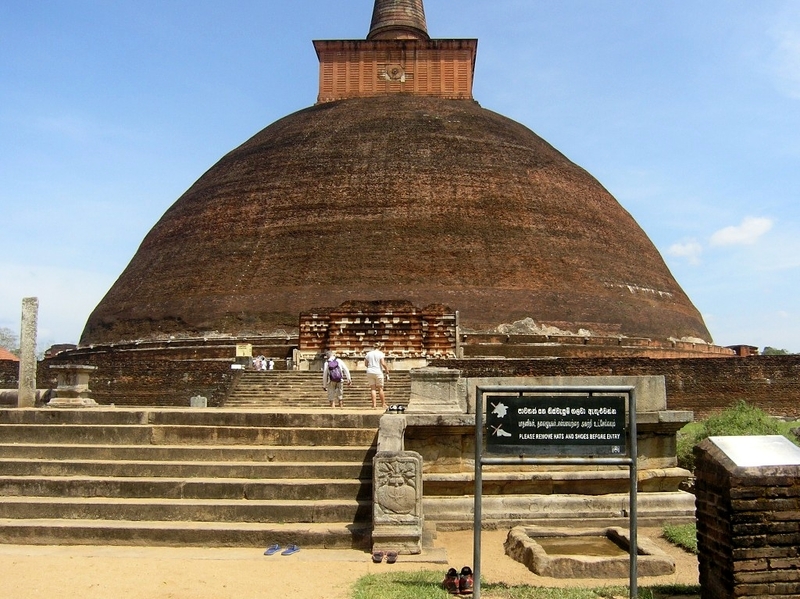 „Anooradapoora, so long the capital of Ceylon, is now a small mean village, in the midst of a desert [im Sinne offenbar nicht von Wüste, sondern von Einöde]. 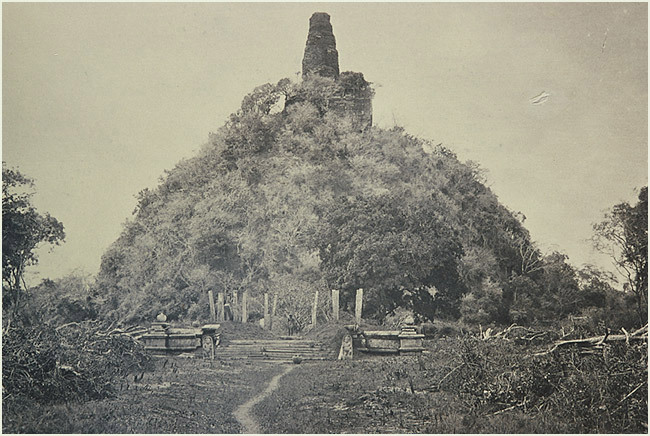 A large tank, numerous stone pillars, two or three immense tumuli, (probably old dagobahs,) are its principal remains. 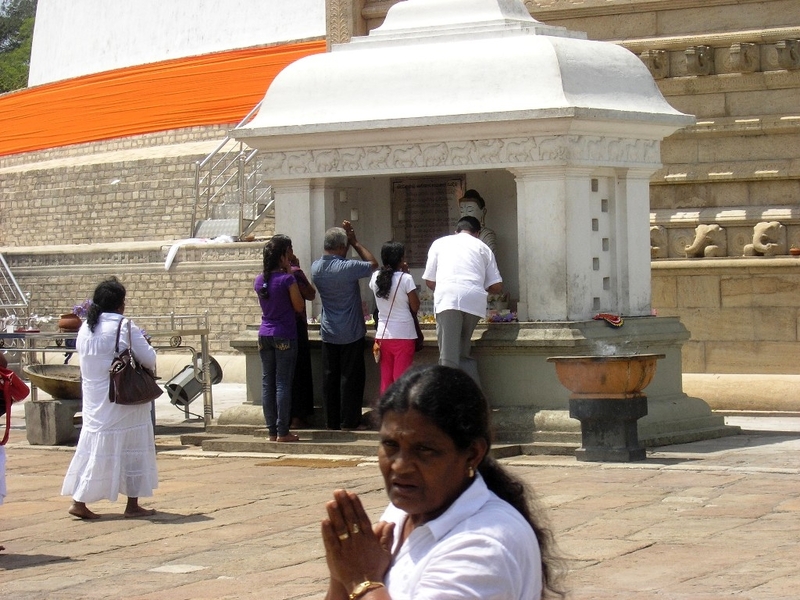 It is still considered a sacred spot; and is a place of pilgrimage“ schrieb John Davy 1821. „Tank“ dient (heute zumindest) als übliche Bezeichnung der inseltypischen künstlichen Seen, von denen es bei der Ruinenstätte allerdings mehrere gibt. Hier ist vielleicht eher ein rechteckiger Teich gemeint, wie der 159m lange sogenannte Elefantenteich. Auch derlei Anlagen gibt es auf dem Gelände allerdings mehrere. Die überwachsenen Dagobas hat man anscheinend erst seit den 1960er Jahren restauriert. Ich konnte nicht ermitteln, wann das Foto oben aufgenommen wurde. Die bei der riesigen (fast nur motorisiert oder per Fahrrad zu erschließenden) Ruinenfläche gelegene heutige, eher unansehnliche Stadt erstreckt sich ebenfalls über ein großes Gebiet und wirkt ziemlich neu. Wie und warum ist sie entstanden? Hatte das mit der Wiederentdeckung der Stätte durch Pilger und Touristen zu tun? 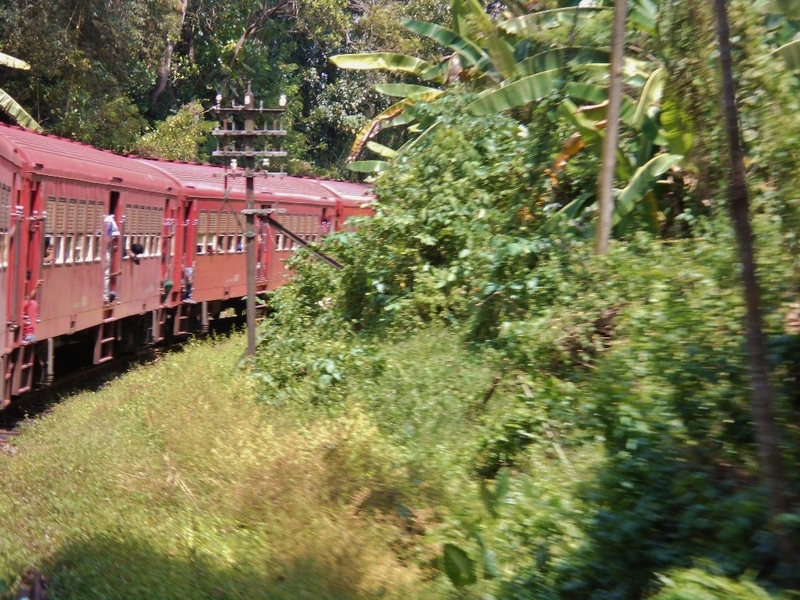 Auch die Bahnlinie von Colombo, die Anuradhapura 1904 erreichte, dürfte ihr Teil beigetragen haben. 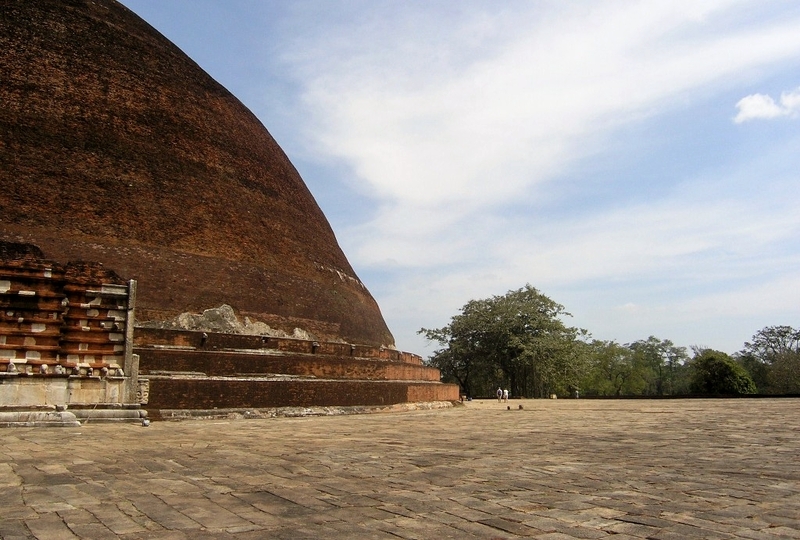 For centuries Anuradhapura was almost deserted. 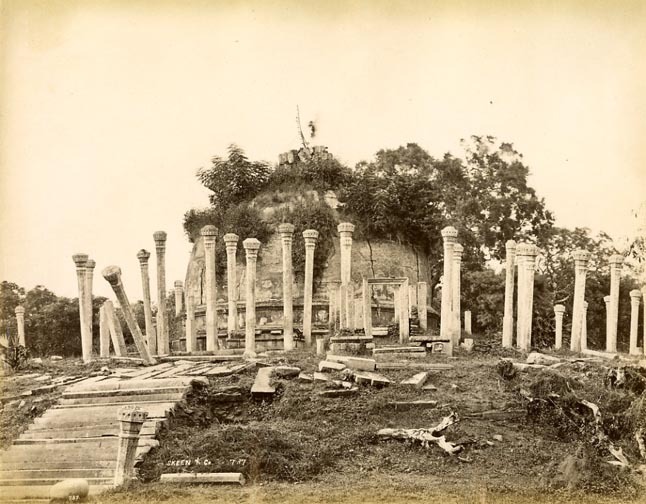 „Anooradapoora, so long the capital of Ceylon, is now a small mean village, in the midst of a desert [clearly used here in the sense of uninhabited area]. 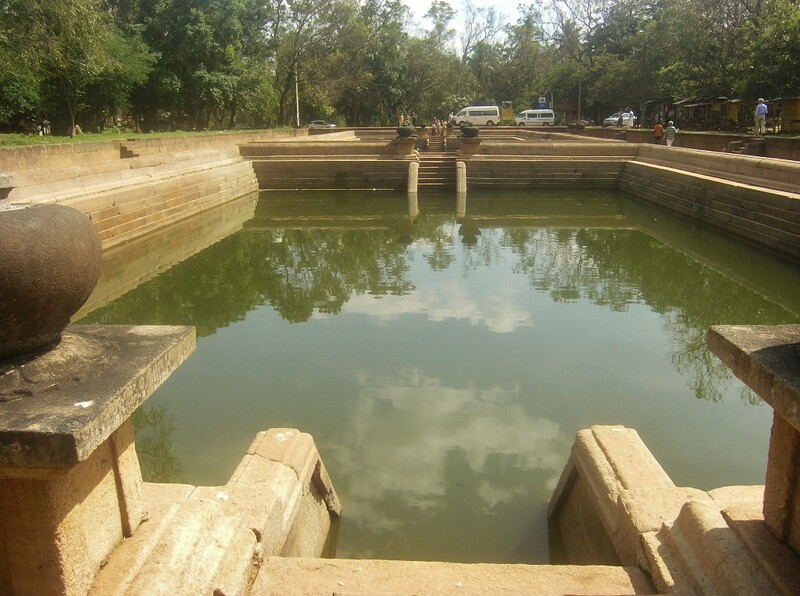 A large tank, numerous stone pillars, two or three immense tumuli, (probably old dagobahs,) are its principal remains. 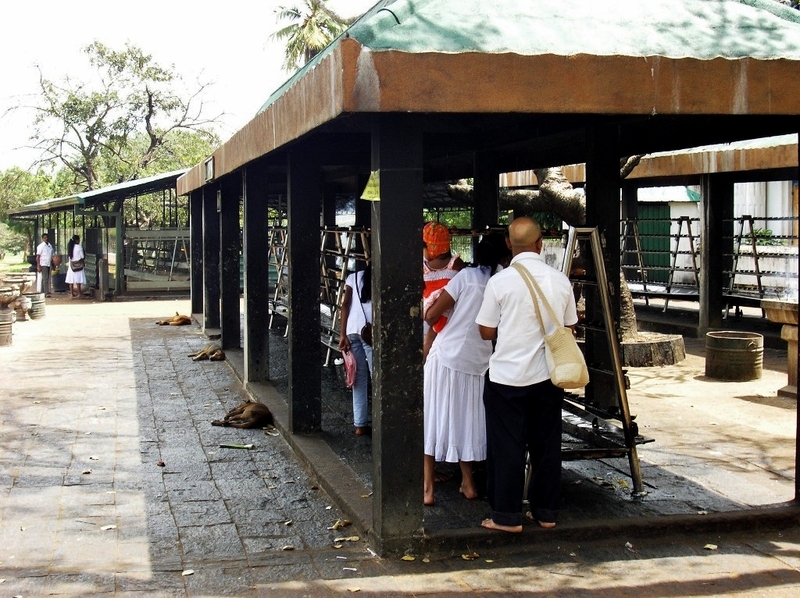 It is still considered a sacred spot; and is a place of pilgrimage,“ John Davy wrote in 1821. 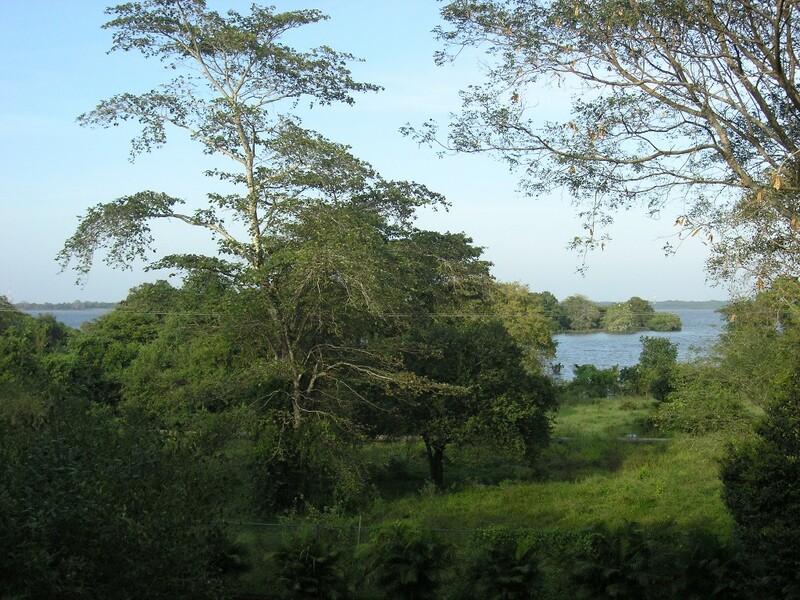 Today at least „tank“ usually refers to the artificial lakes that are so typical of the island — and of which there are in fact several amid the ruins, which are so extensive that you had better have a motor vehicle or a bicycle to explore them. 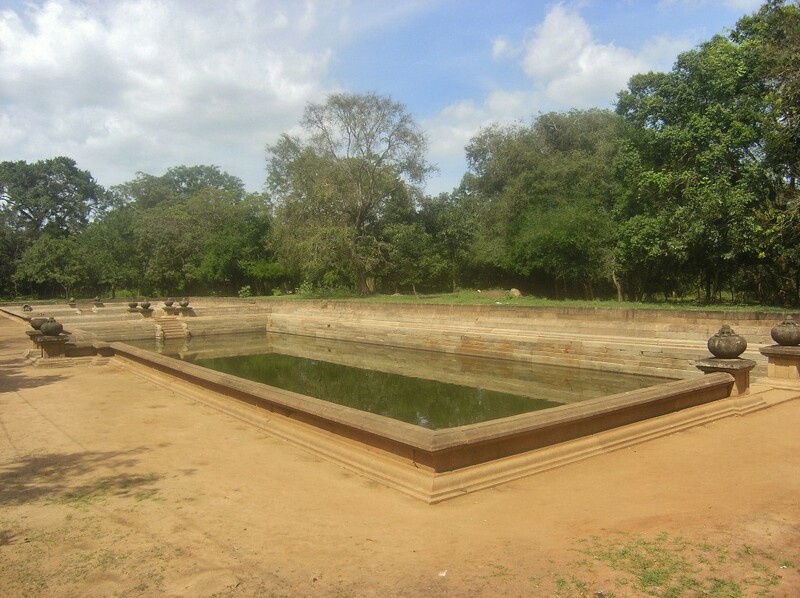 Maybe Davy means a rectangular pond, such as the so-called Elephants‘ Pond, 159 metres long. 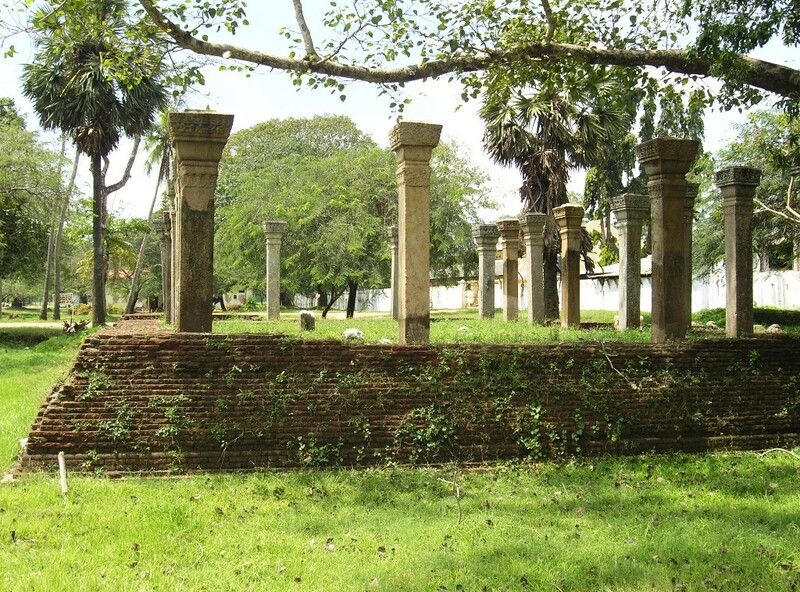 It seems that the dagobas, until then overgrown, have been restored only from the 1960s onwards. I could not find out when the photograph above was taken. The modern, rather unsightly town situated next to the ruins is also quite extensive and looks quite new. 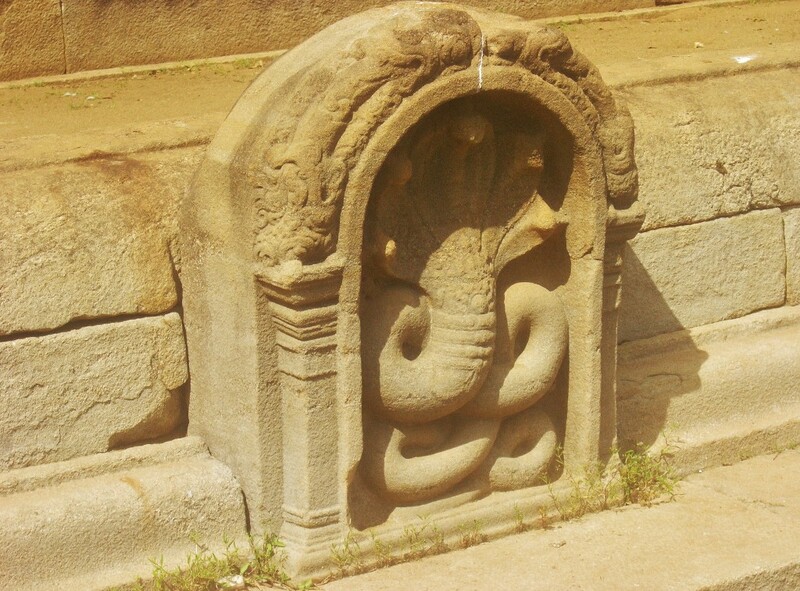 When and why did it come into being? 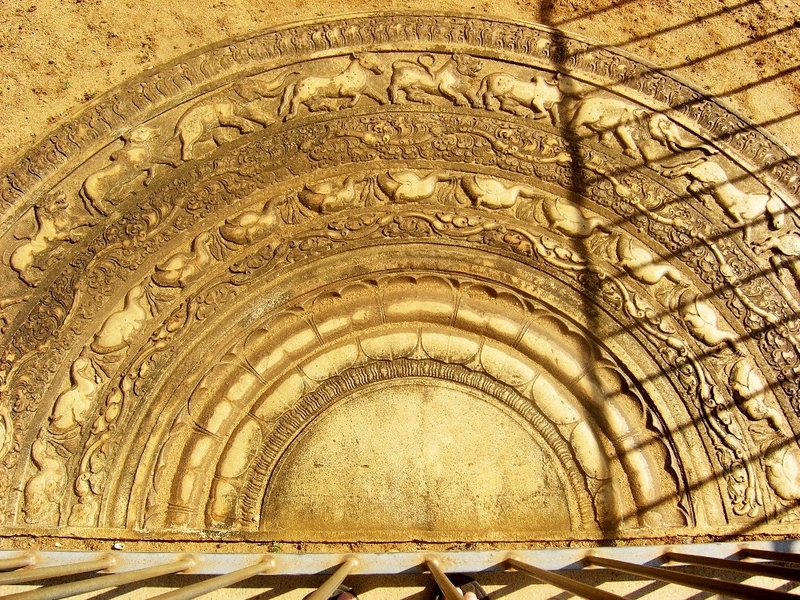 Was this a result of the rediscovery of the site by pilgrims and tourists? 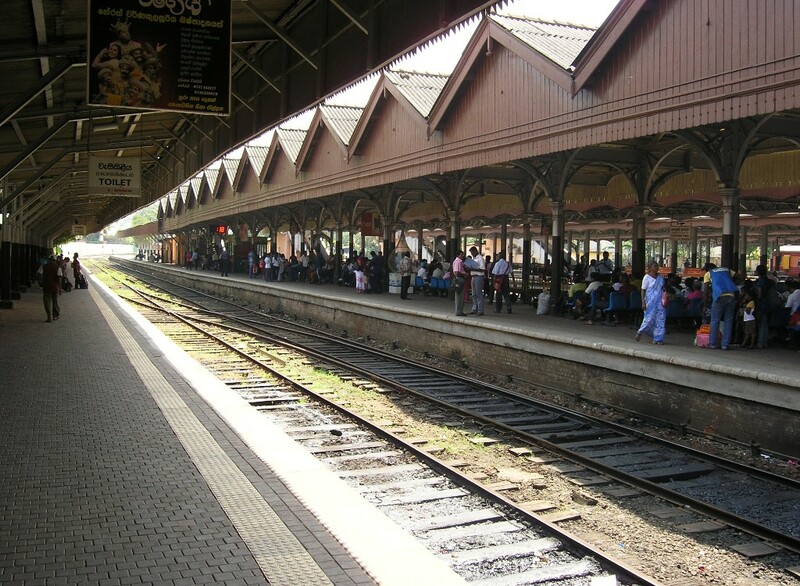 The railway line from Colombo, which reached Anuradhapura in 1904, no doubt contributed too. Falls vorhanden zieht man die Socken besser nicht mit aus. Diese Steinplatten heizen sich in der Tropensonne mörderisch auf! If you are wearing any do not take off your socks along with your shoes. 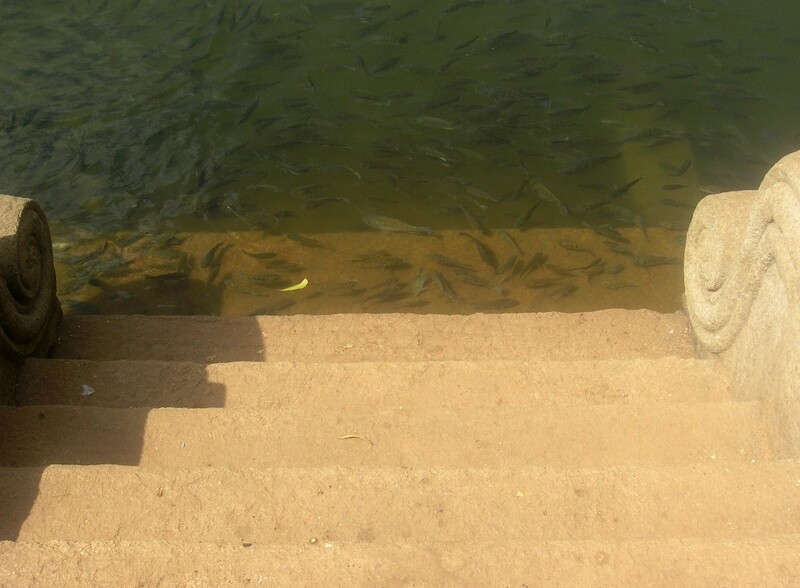 These flagstones get murderously hot in the tropical sun. Ostansicht. — The view from the east. Aus der Monotonie der immer gleichen kleinen Plattformen sticht unter anderem dieses Gebäude mit seinem riesigen, noch immer über acht Meter hohen Portal heraus. 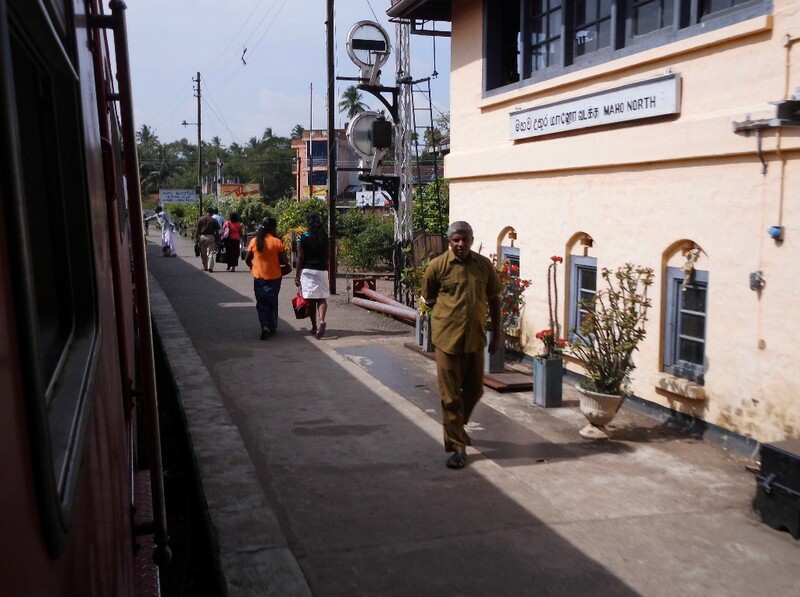 From the monotonous expanse of countless, identical small platforms this building with its giant door, even now over eight metres high, stands out. 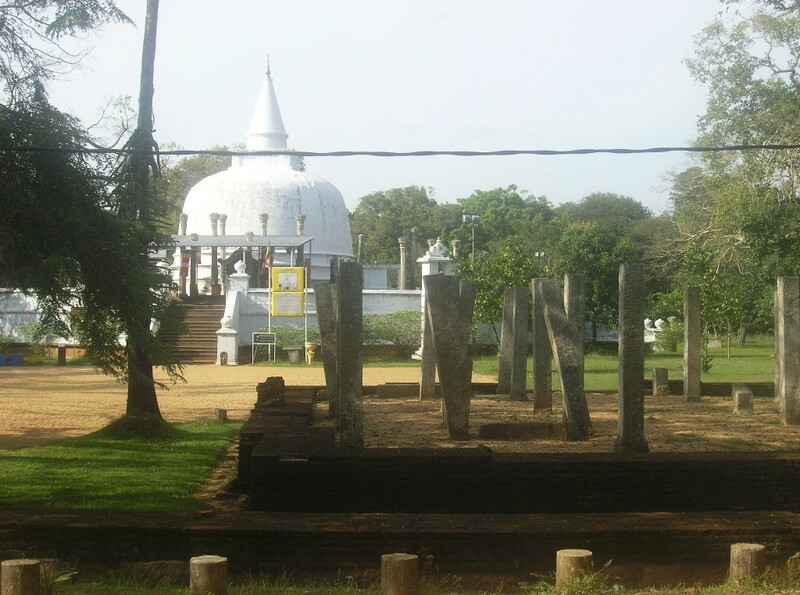 Unter den großen Dagobas in Anuradhapura der belebteste. Höhe 103m, als Bauherr gilt Dutugamunu (König 161-137 v.u.Z.). 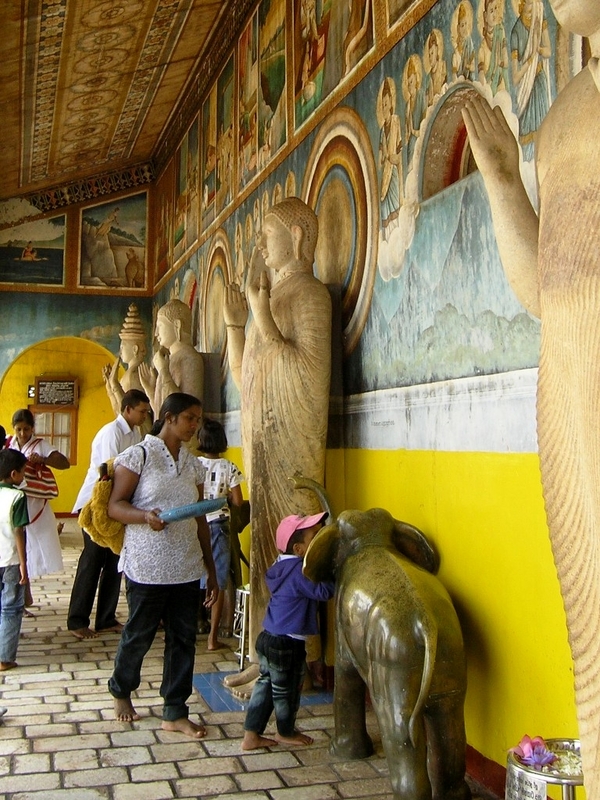 Among the great dagobas in Anuradhapura this is the busiest. 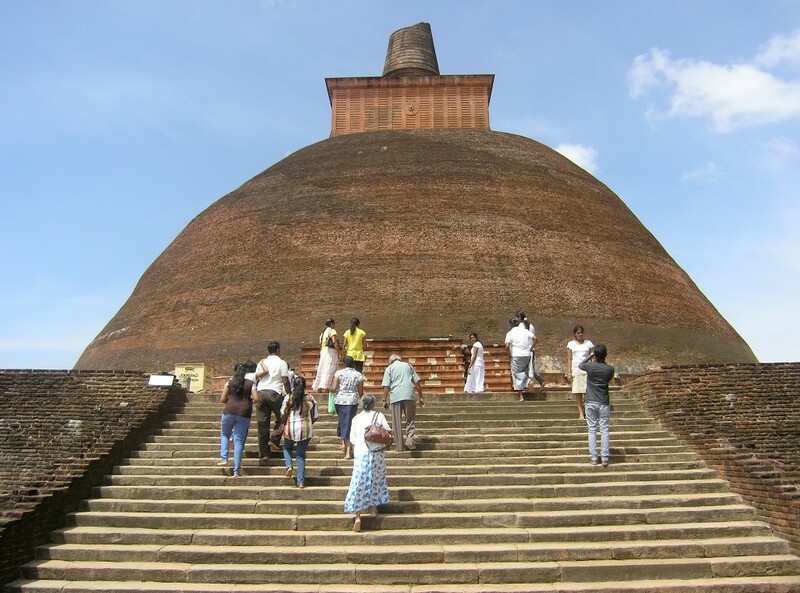 Height 103m, supposedly built by King Dutugamunu (reigned 161-137 BCE). Baugerüst aus Bambus. 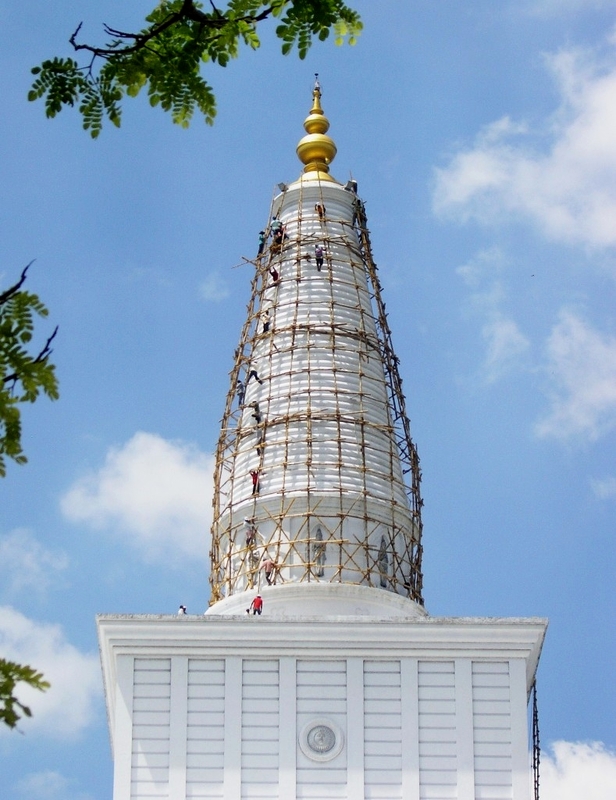 — Bamboo scaffolding. 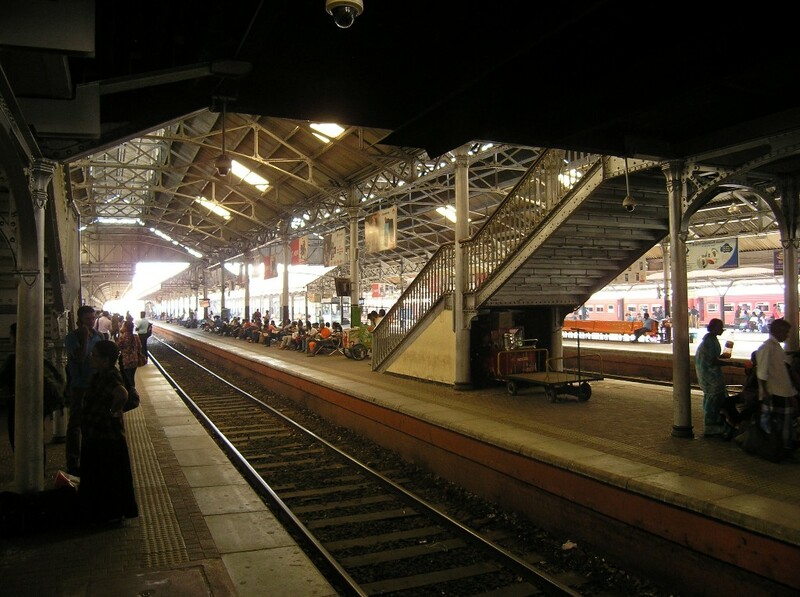 Ruwanwelisaya: Nebengebäude auf der Plattform — Ancillary building on the platform. 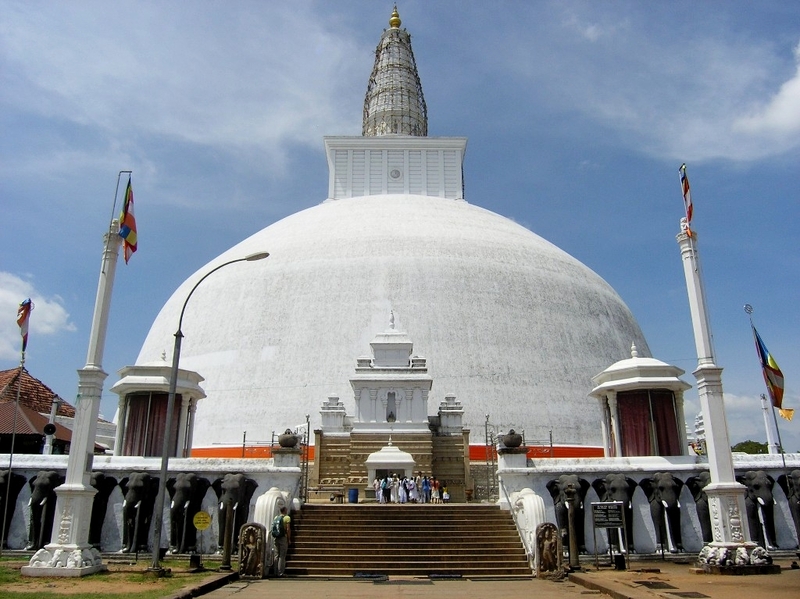 „As a form of respect kindly dress in white clothing at this sacred venue.“ (Beim Eingang zum Bodhi-Baum.) Wird auch von Einheimischen nicht durchgehend befolgt, man sieht aber hier und an ähnlichen Stätten auf der Insel immer viel Weiß. 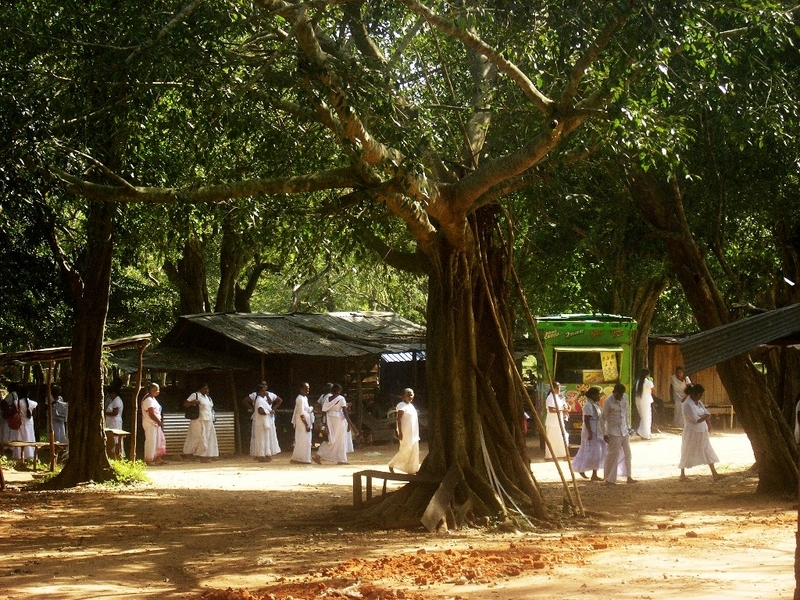 „As a form of respect kindly dress in white clothing at this sacred venue.“ (At the entrance to the Bodhi tree.) 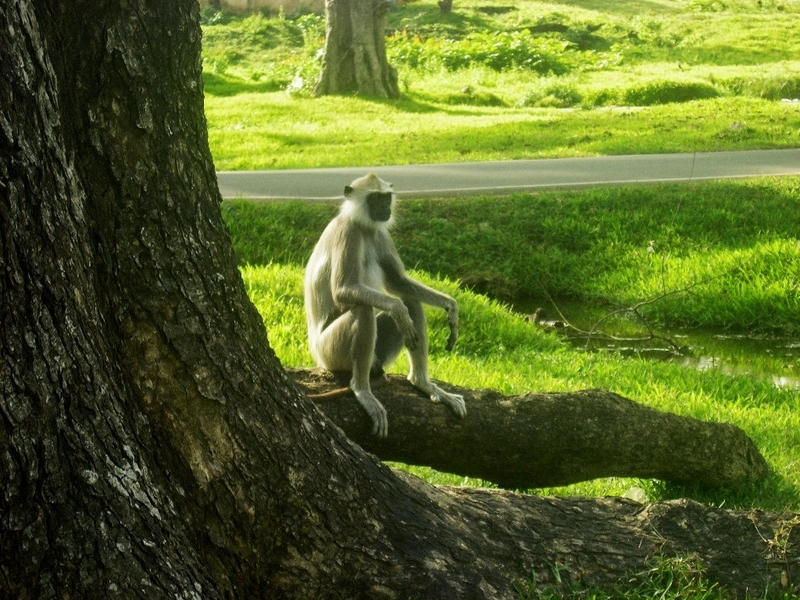 The natives don’t always do it either, but you do see a lot of white here and at other, similar sites in the island. Der Ableger des ursprünglichen Bodhi-Baums soll hier 249 v.u.Z. 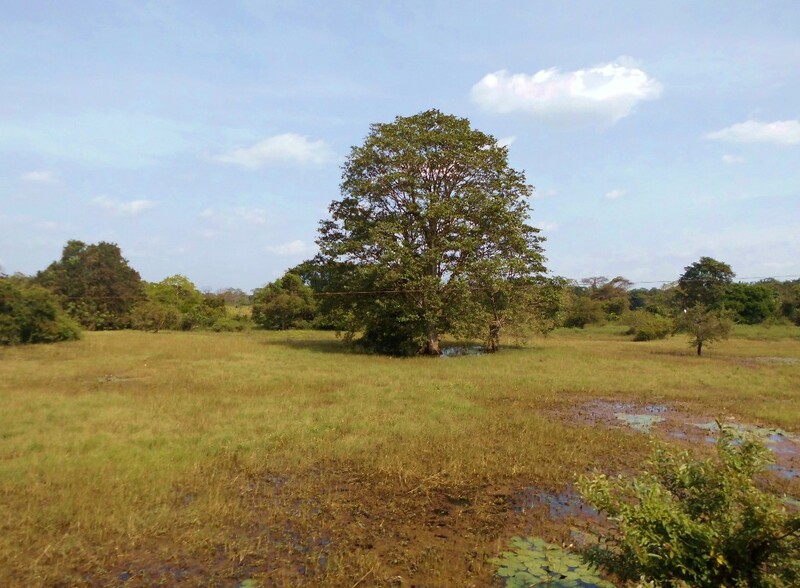 gepflanzt worden und der planetenweit älteste Baum mit bekanntem Pflanzdatum sein. 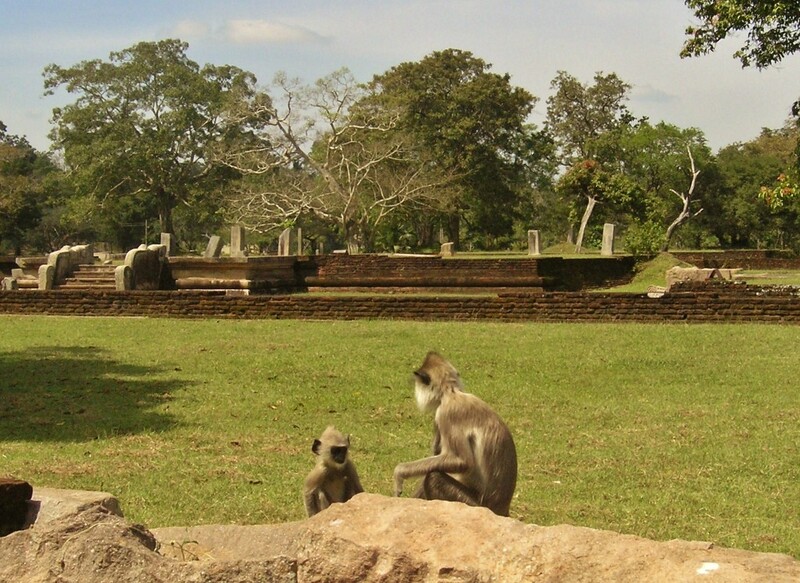 Ihn umgeben weitere Exemplare derselben Baumart (Ficus religiosa). 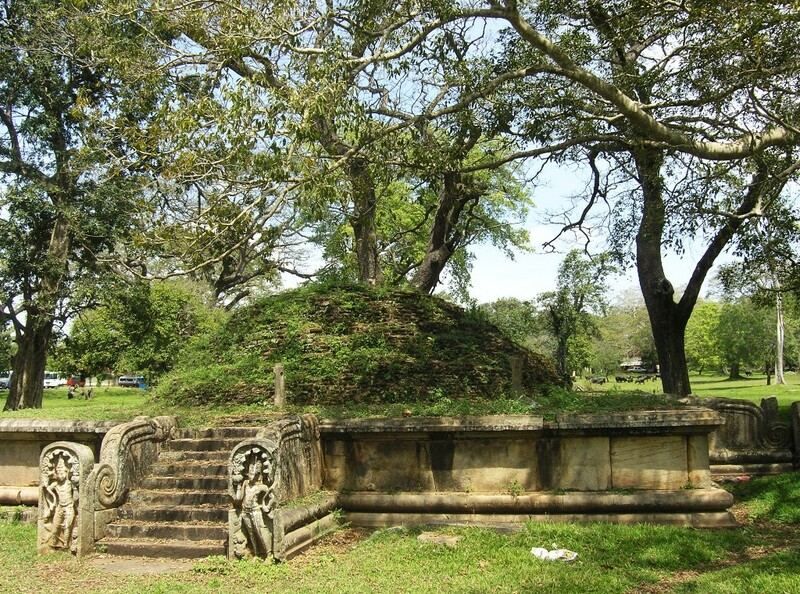 Im Vordergrund die Umfriedung des Bezirks, erbaut angeblich unter Kirti Sri Rajasinha (König 1747-82, in Kandy). 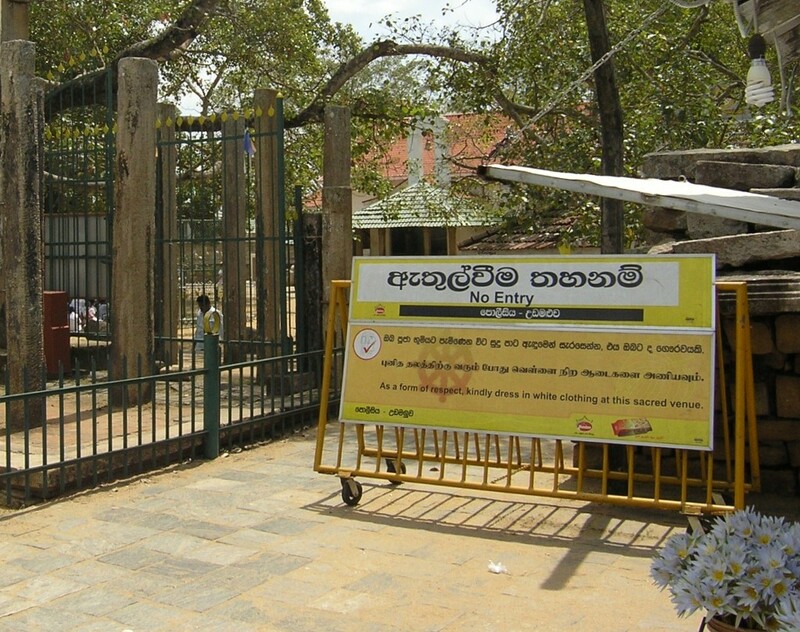 The cutting of the original Bodhi tree is said to have been planted here in 249 BCE, which would make it the oldest tree on the planet with a known planting date. 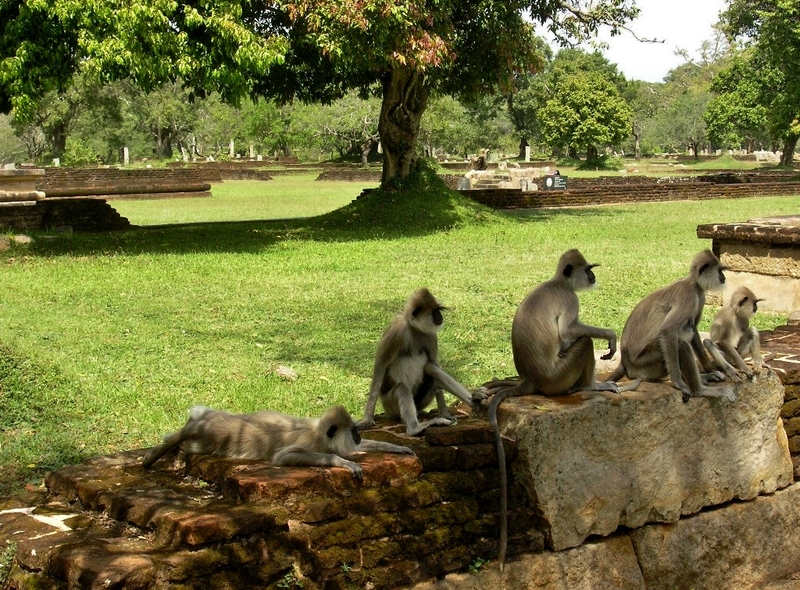 It is surrounded by other specimens of the same species (Ficus religiosa). 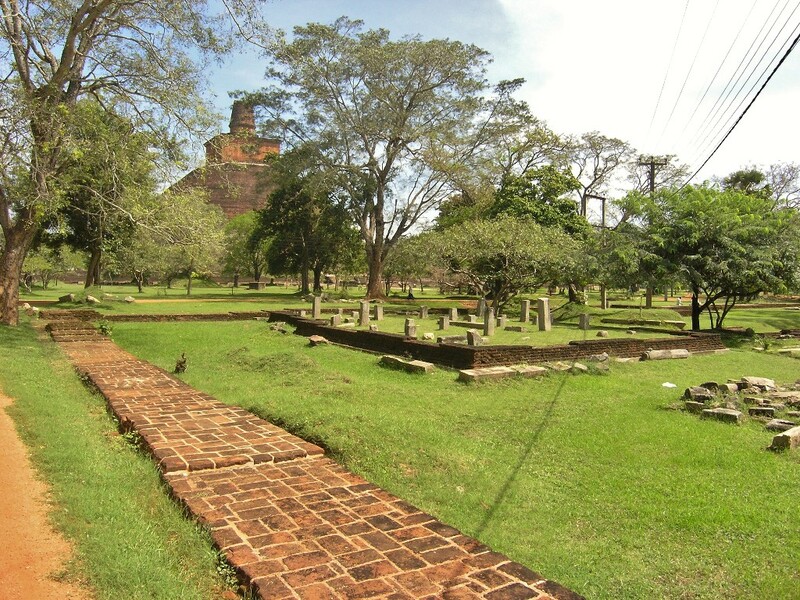 The wall in the foreground, supposedly built unter King Kirti Sri Rajasinha (reigned 1747-82, in Kandy) surrounds the precinct. Unter den Überdachungen stehen Regale für Öllämpchen, die die Pilger anzünden und dort aufstellen. 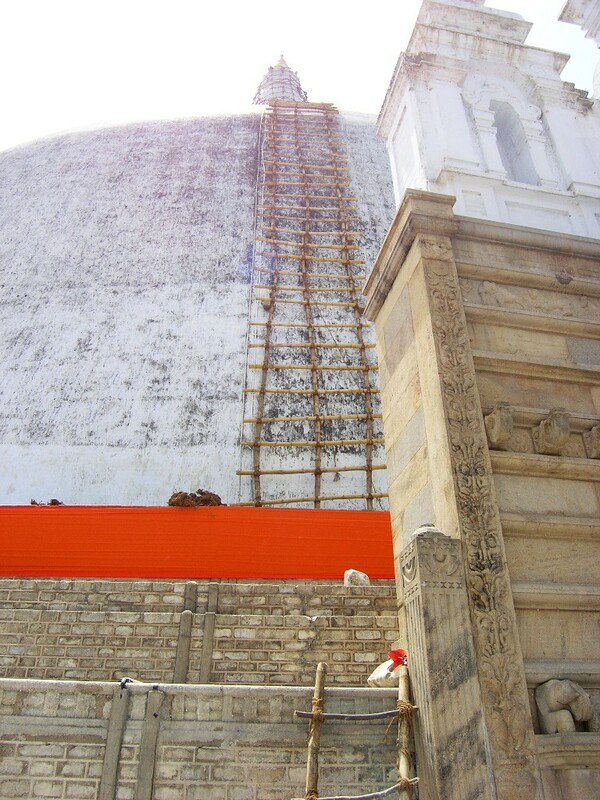 Placed unter the roofing there are shelves for oil lamps lit and offered by the pilgrims. Valagamba (König 89-77 v.u.Z.) zugeschrieben. Kleinere Dagobas wie diesen umgab ursprünglich ein Rundbau, dessen steinerne Pfeiler noch sichtbar sind. 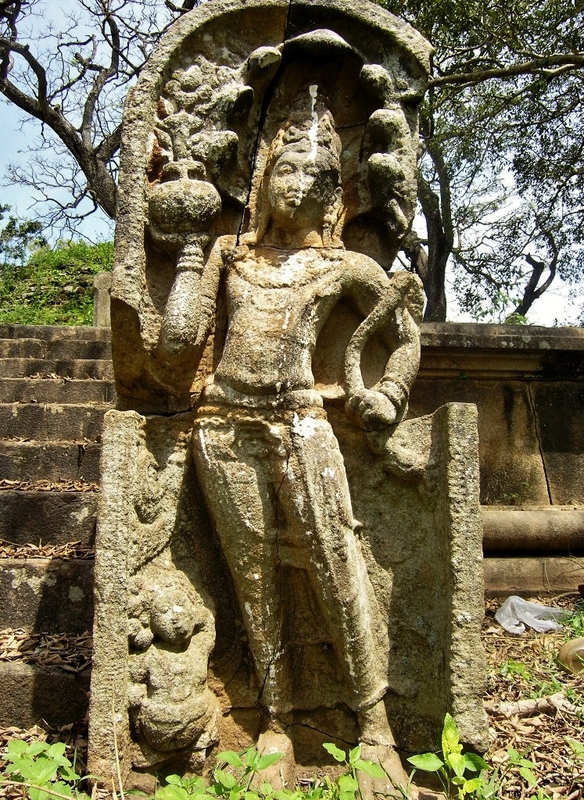 Attributed to King Valagamby (reigned 89-77). 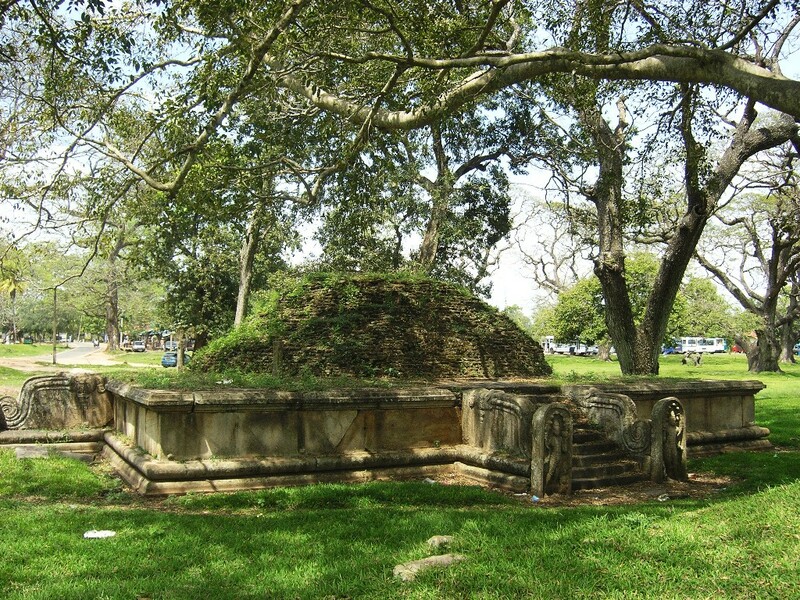 Smaller dagobas like this one were originally surrounded by a round hall, whose stone pillars are still visible. 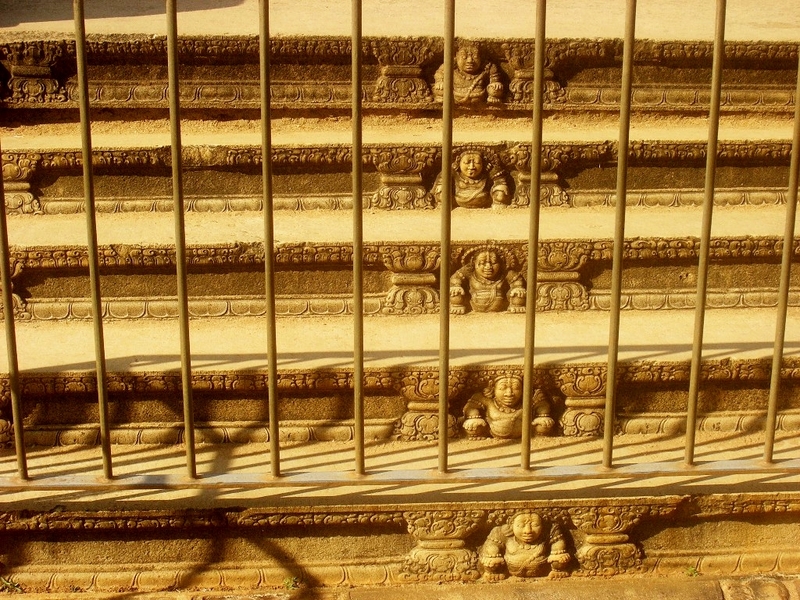 Dieses Bauwerk wird als „Mahasenas Palast“ bezeichnet und ist für seinen Mondstein berühmt (so bezeichnet man die halbkreisförmigen Steinplatten vor Treppenfluchten buddhistischer Bauwerke). 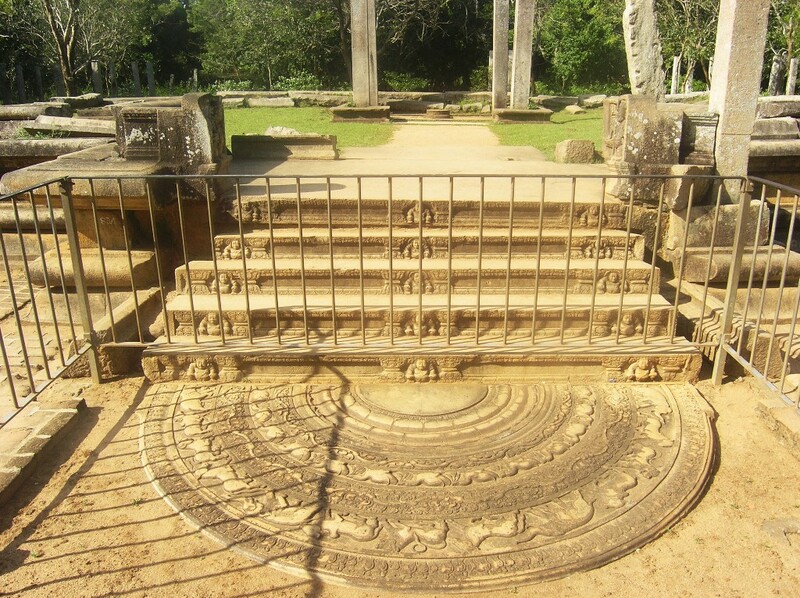 This building, referred to as „Mahasena’s Palace“, is famous for its moonstone (that’s the semicircular sculpted slab that in Buddhist buildings is placed in front of a flight of stairs). Das unter Valagamba (König 89-77 v.u.Z.) 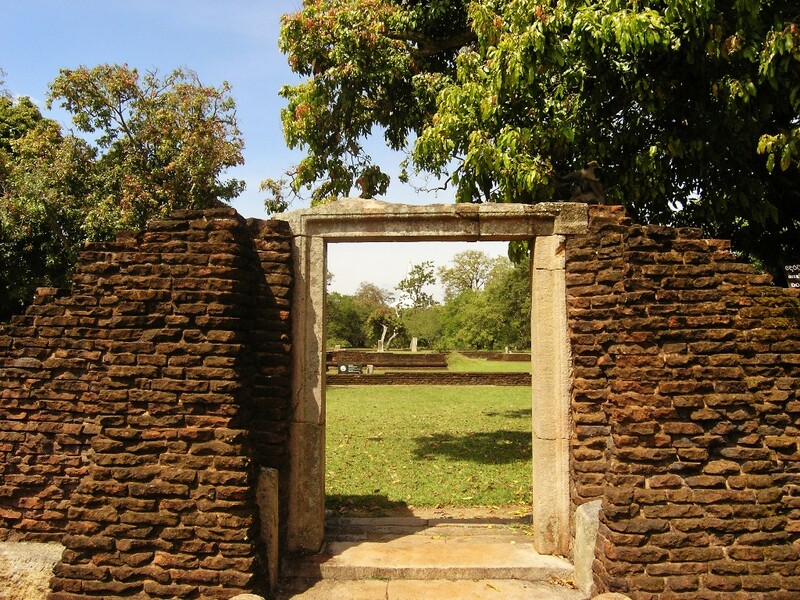 gegründete Abhayagiri-Kloster gehörte zu den größten und auch räumlich ausgedehntesten der Insel. 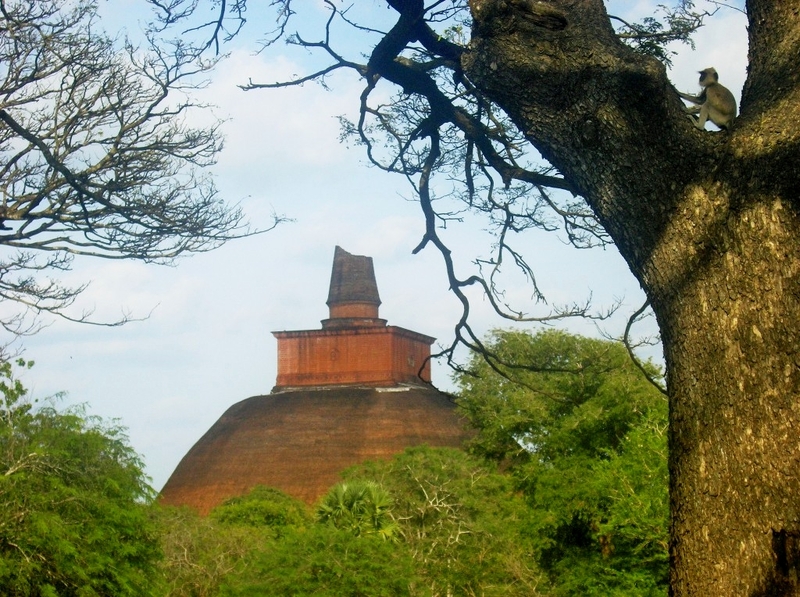 The Abhayagiri monastery founded unter Valagamba was one of the biggest and also most extensive, in terms of its buildings, in the island. 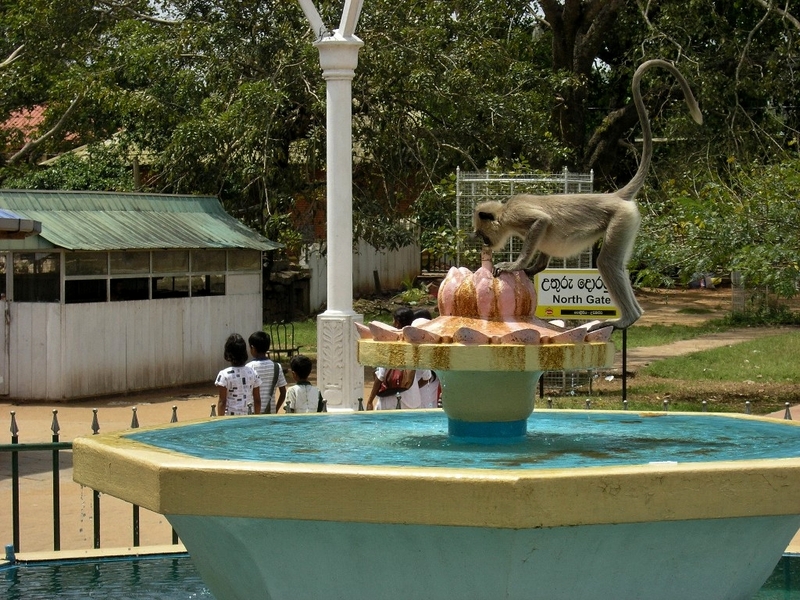 Kuttam Pokuna („Zwillingsteich“). Zweck unbekannt, als Entstehungszeit wird die Herrschaft Aggabodhis I. (575-608) genannt, doch könnte ich mir vorstellen, daß das nur Vermutung ist. 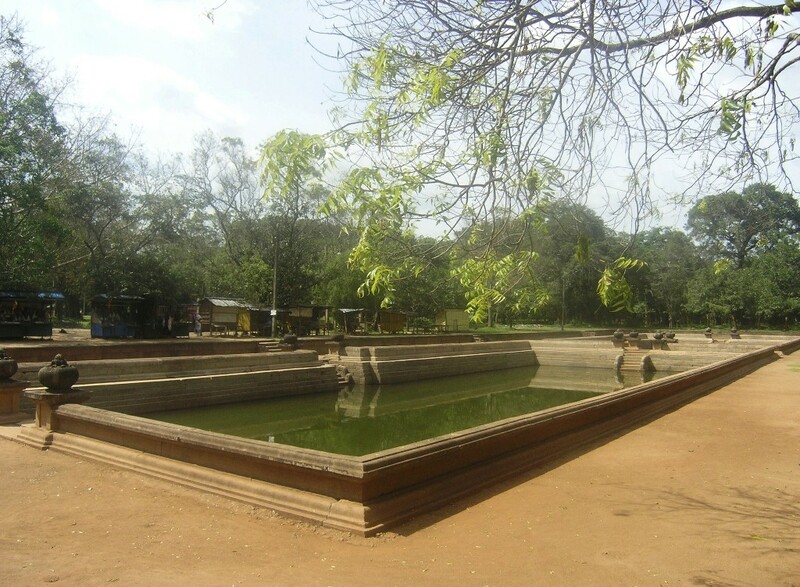 Kuttam Pokuna („Twin Pond“). Its purpose is unknown. It is dated to the reign of King Aggabodhi (575-68), but I suspect that is not much more than a guess.